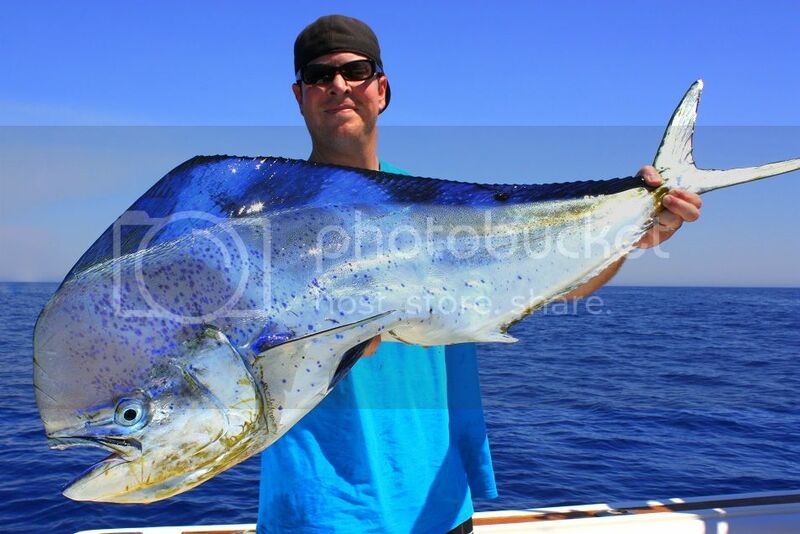 Despite another weekend of breezy conditions, the Offshore fishing was again very good. 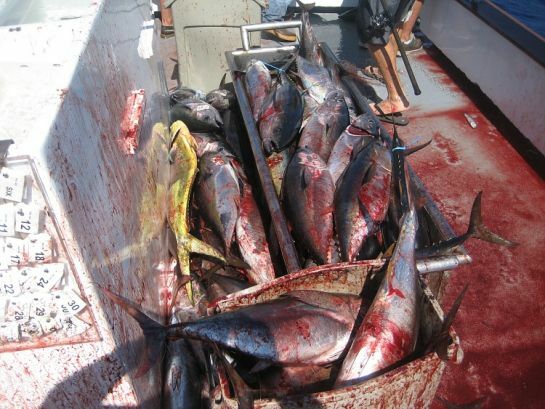 The one day Sport Boats did not get into the wide open Tuna bites they became accustomed to, yet filled the boat with lots of Yellowtail, some Dorado and Tuna. 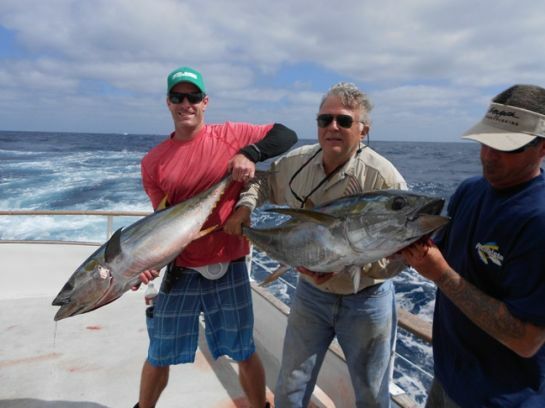 The 1.5 day trips did far better than single day trips, while 2 day and 3 day trips usually ended up with limits of Yellowfin Tuna, and a good variety of Dorado, Yellowtail, Bluefin Tuna and the occasional Albacore. As the week progressed and our first storm of the year came through the Tuna counts were fading. Would like to get out one more time myself, however, once again on the weekend and forecasted through early next week is breezy offshore conditions. 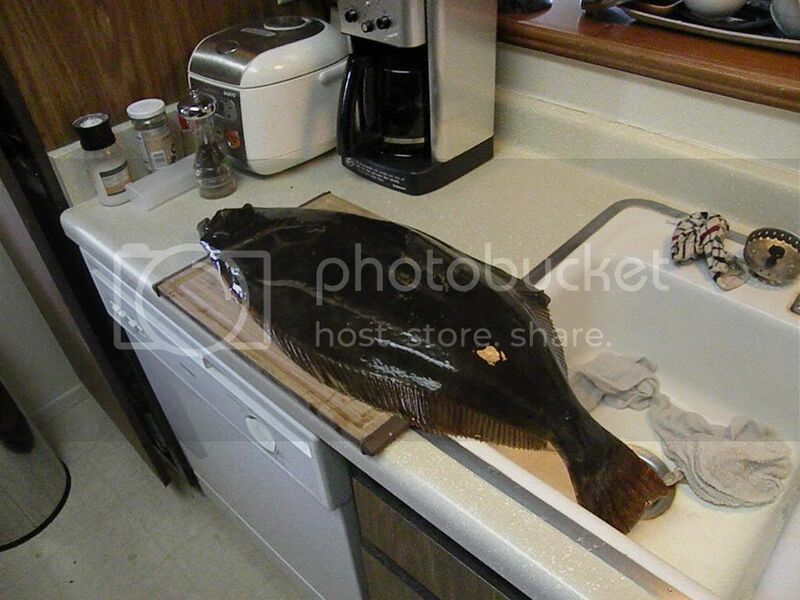 As the water cools the fish head south, bummer. However, it has a been a banner season for most. Far better fishing this year than the last two years. 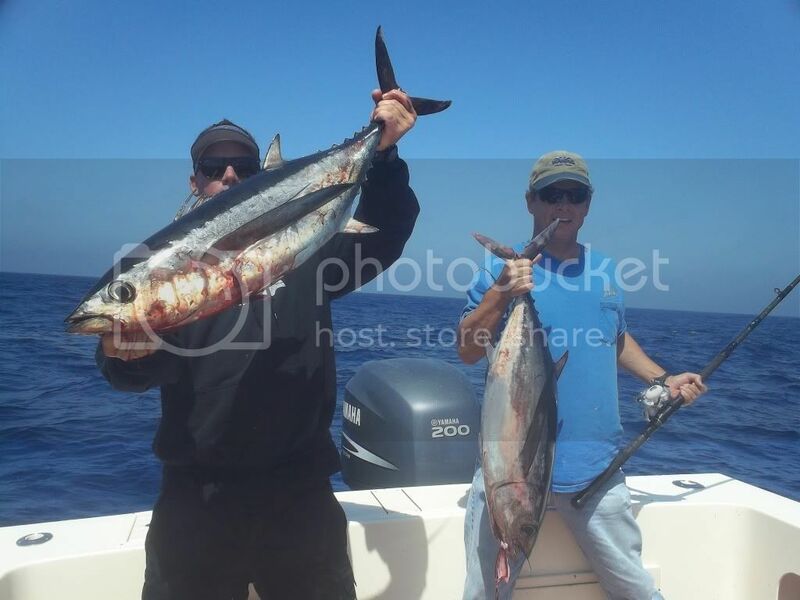 There were few private boater boats this week with the best fishing down at the 1010 Trench, some 65 miles south of Point Loma. Mostly the bigger boats ventured as far south as the D220 and west to the 213 Banks, with 80 miles a beginning destination for the 1.5 and longer trips. The inshore banks, Hidden, 302, 371 and 425 are still yielding mostly Rat Yellowtail and a few Dorado, yet not much in the way of any Tuna, although the ¾ day boats found a good school of Bluefin Tuna mixed in with the incredible amount of small Yellowtail remaining in the area near the Hidden Bank. 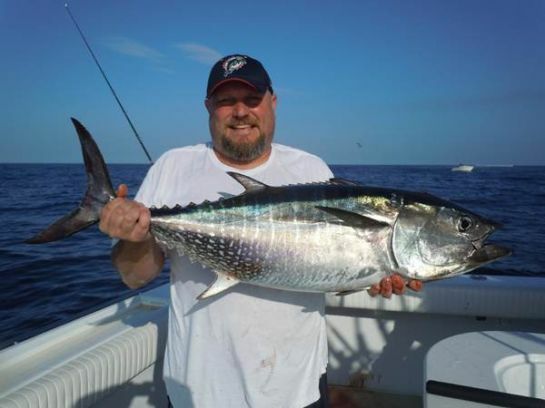 The Ranger 85 returned Friday, 10-12-12 from a 2.5 day trip with 30 anglers catching 22 Bluefin Tuna, 93 Yellowfin Tuna, 128 Yellowtail and18 Dorado. 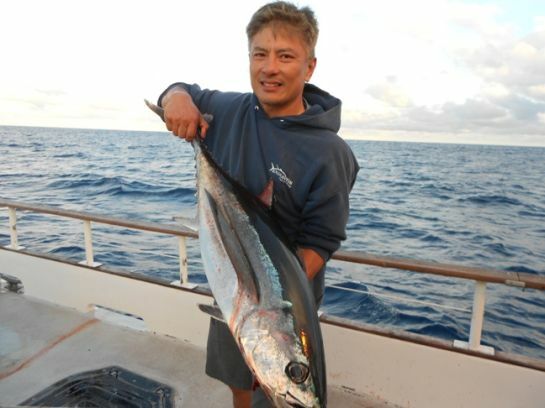 The Pacific Voyager, returned from a successful 2.5 day trip Monday, 10-08-12 with a great mix of fish: 120 Bluefin Tuna, 118 Yellowfin Tuna and 2 Albacore Tuna. 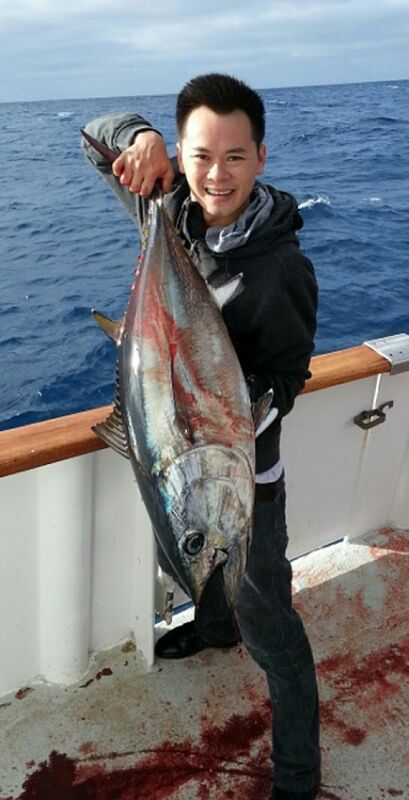 There has been a small snap on the Yellowtail at Catalina Island this week. 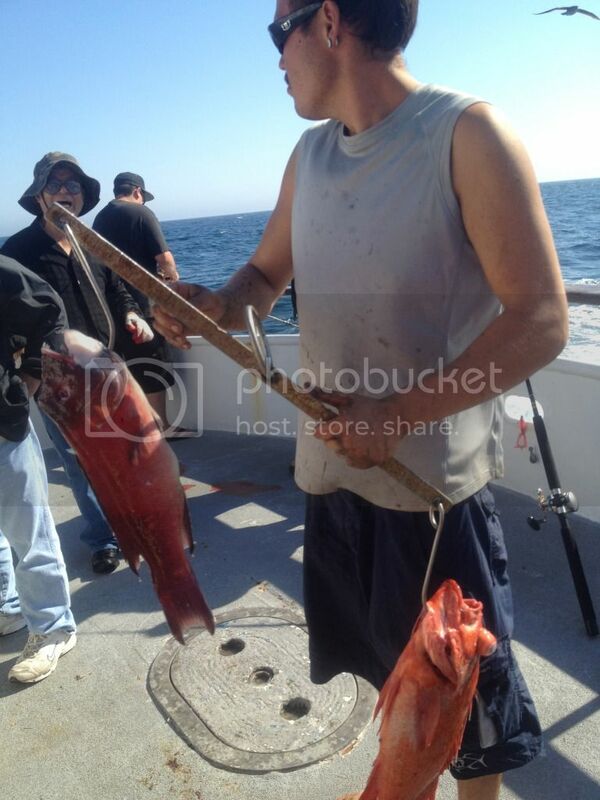 The ¾ day boat Enterprise made the run to Catalina on Saturday, 10-06-12 and caught 2 Yellowtail, 38 Sheephead, 137 Whitefish, 154 Rockfish, 1 Bonito, 4 Sculpin, 210 Perch and 1 Cabazon. 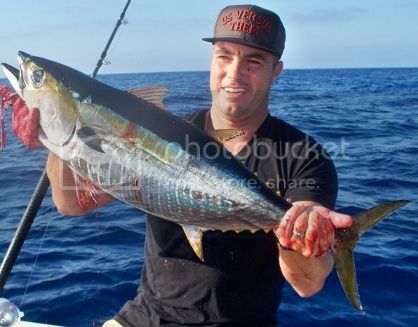 There was also a short window of opportunity at San Clemente Island on the Yellowtail, where they bit well most of last week until the weather turned on the weekend. 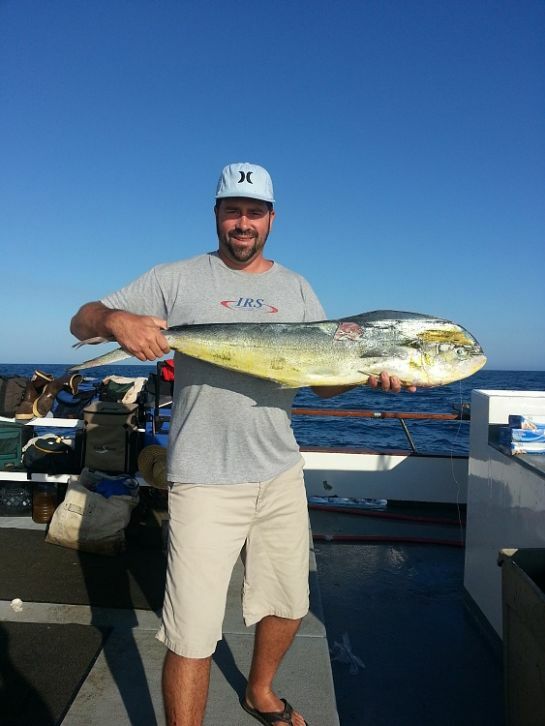 Private boater Glen fished the weekend with friends at the Island and they caught 8 Yellowtail on Saturday and 9 on Sunday. 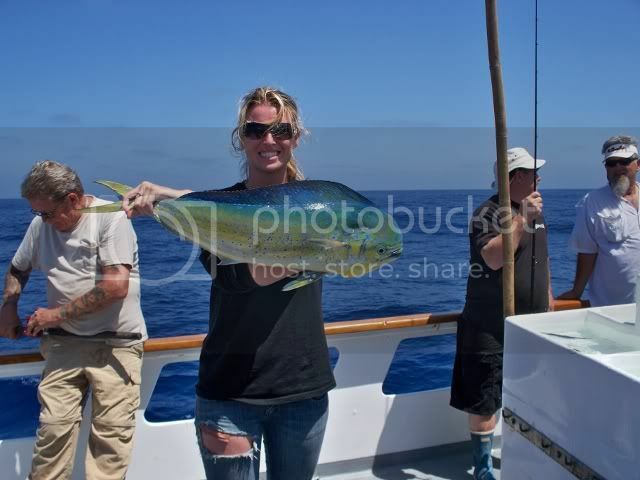 The Fury returned from a 2-day trip, Friday/Saturday, caught 131 Yellowtail and lots of Calico Bass on their trip. 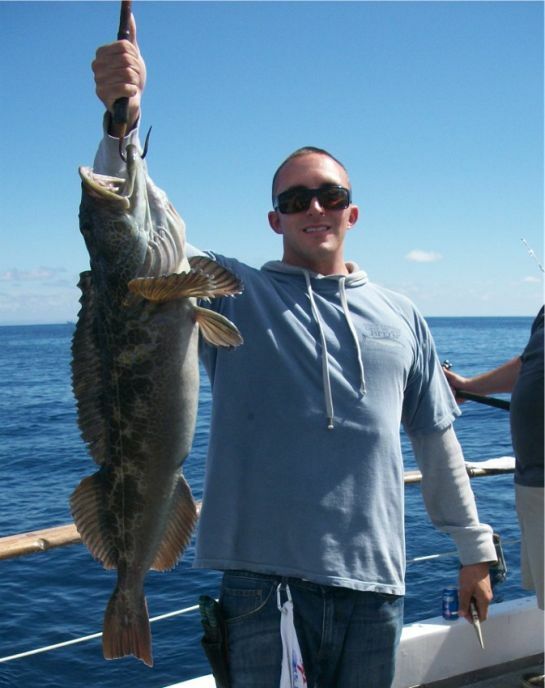 In Santa Monica the 3/4 day boat Tradition had a decent day on their Saturday, 10-06-12 trip catching 10 Calico Bass, 6 Sand Bass, 142 Rockfish, 2 Lingcod, 75 Sculpin, 30 Perch and 2 Cabazon. 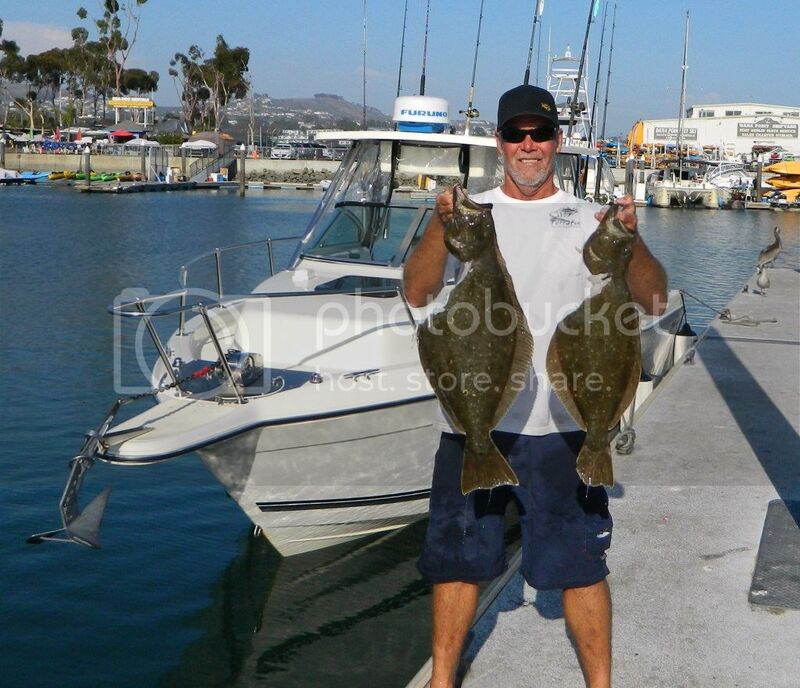 The New Del Mar had a decent day of Bass fishing on Tuesday, 10-09-12, catching 32 Calico Bass, 21 Sand Bass, 1 Sheephead, 85 Rockfish, 1 Lingcod, 30 Sculpin and 2 Cabazon. 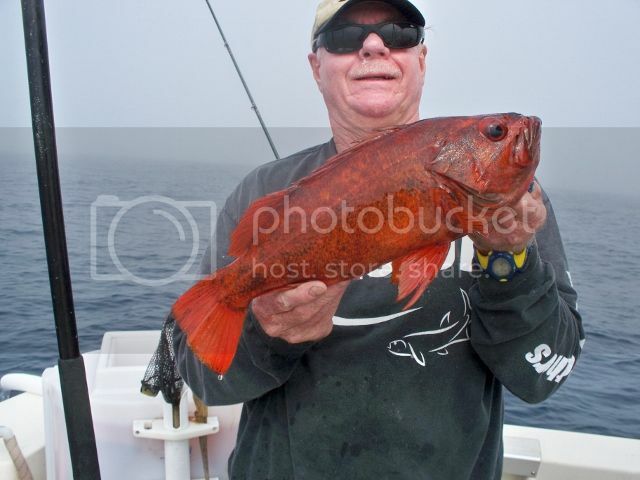 Out of San Pedro, the ½ day boat Monte Carlo had a decent trip Monday, 10-08-12 catching 28 Calico Bass, 4 Sand Bass, 16 Sheephead, 7 Whitefish, 16 Rockfish, 1 Lingcod, 3 Sculpin, 3 Sargo and 46 Red Snapper. 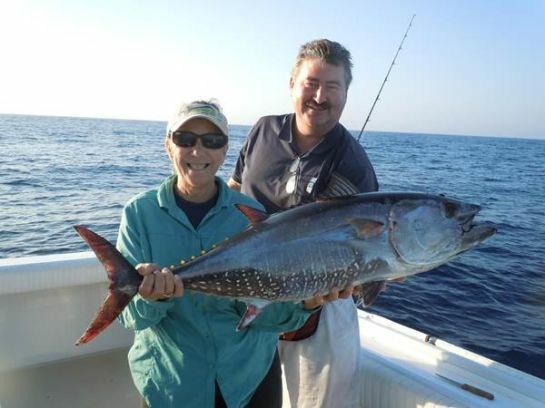 Out of Newport Beach, the Thunderbird ended a 2-day trip on Sunday, 10-08-12 catching 1 Bluefin Tuna, 14 Yellowfin Tuna, 10 Skipjack Tuna, 59 Yellowtail and 17 Dorado for 17 anglers. 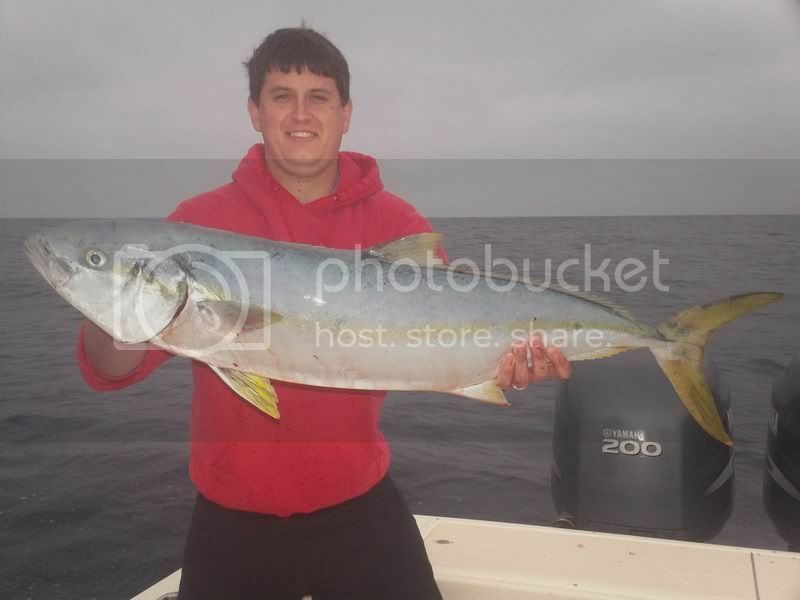 The Freelance fished Tuesday, 10-09-12 and caught 1 Yellowtail, 58 Calico Bass, 1 Barracuda, 4 Sheephead, 8 Rockfish and 40 Perch. The Freelance fished Sunday evening, 10-08-12 and caught 1 Halibut, 3 Calico Bass, 4 Sand Bass, 18 Rockfish, 81 Sculpin, 12 Yellowfin Croaker and 3 Sargo. Most boats have discontinued twilight trips as the demand has dwindled? 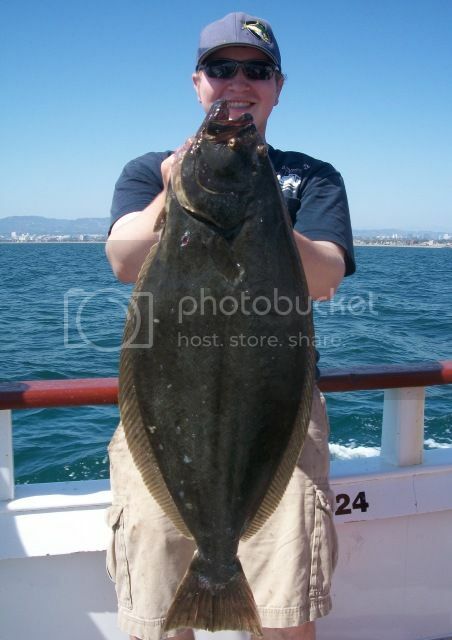 The Nautilus fished on Saturday, 10-06-12 in the evening catching 7 Calico Bass, 12 Rockfish, 60 Sculpin (limits) and 4 Sargo. The Pursuit out of 22nd St. Landing, ran to the Island on Saturday, 10-06-12, with 20 anglers catching 30 Calico Bass, 35 Sheephead, 45 Whitefish, 40 Bocaccio, 150 Rockfish, 1 Lingcod, 200 Perch and 19 Red Snapper. The Freedom caught 15 Yellowtail, 26 Calico Bass, 6 Barracuda, 3 Sheephead, 7 Whitefish and 73 Perch on their Saturday, 10-06-12 trip. 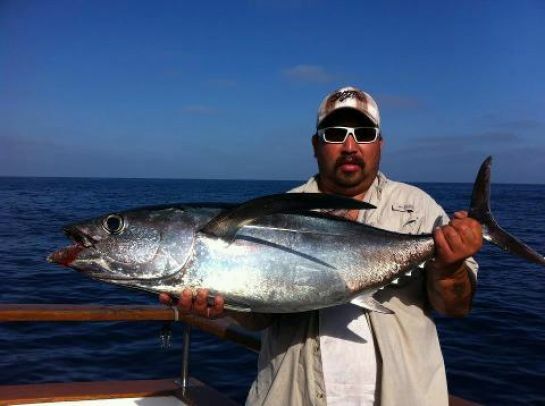 The ¾ day boats are running offshore to catch mostly Yellowtail and Dorado; however they got a taste of Bluefin Tuna this week to go with the amazing Yellowtail fishing. 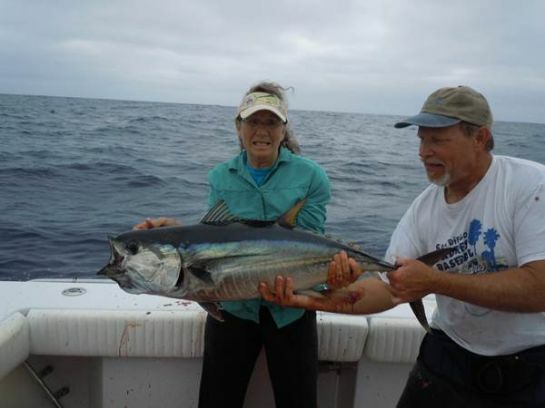 The ¾ day boat San Diego out of Seaforth Landing caught 22 Bluefin Tuna, 195 Yellowtail and 11 Dorado on their Tuesday, 10-09-12 trip. 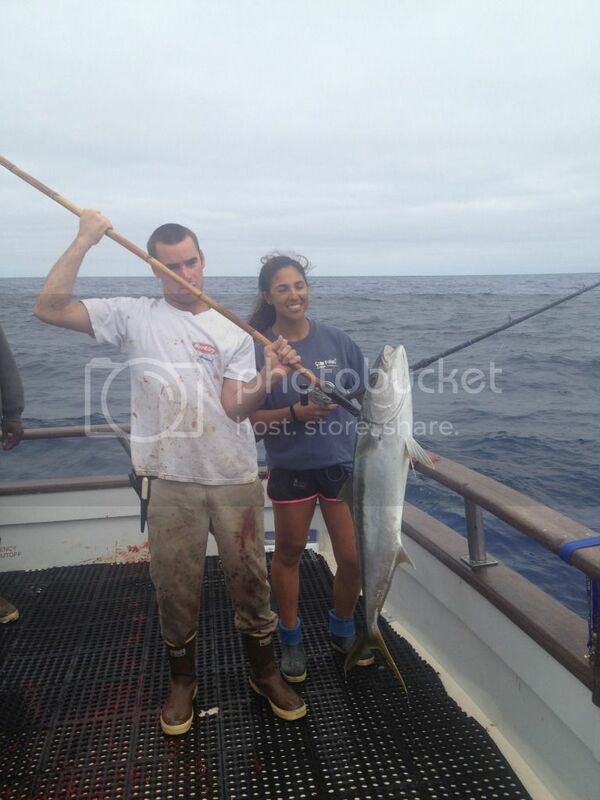 The Mission Belle headed out on Sunday, 10-07-12, and caught 1 Bluefin Tuna, 135 Yellowtail and 12 Dorado. 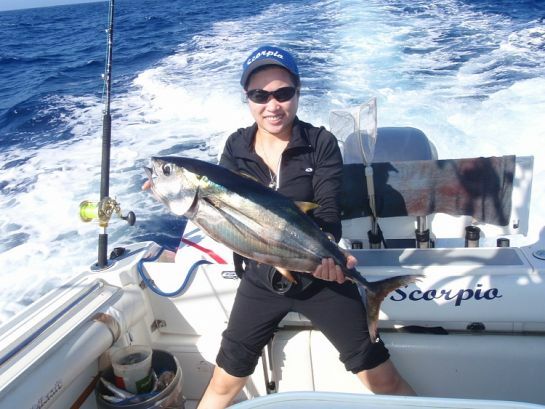 The ¾ day boat Malihini caught 2 Bluefin Tuna, 140 Yellowtail and 2 Dorado on their trip on Monday, 10-08-12. WeatherThe weather forecast for both Saturday and Sunday looks to be quite breezyfor the offshore runs. Always check the latest forecast before leaving the dock. 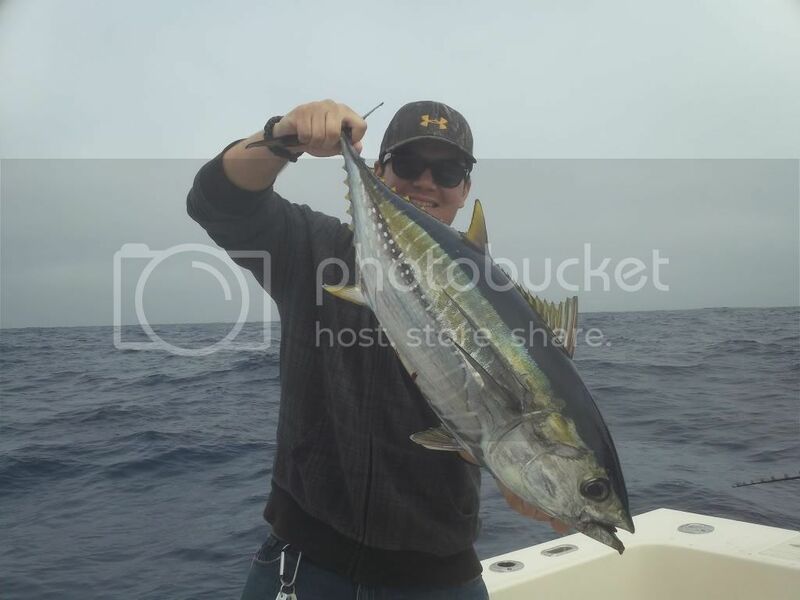 Despite some very breezy conditions over the weekend, due to Hurricane Miriam, the Offshore fishing was decent for most of those that ventured out into the slop. 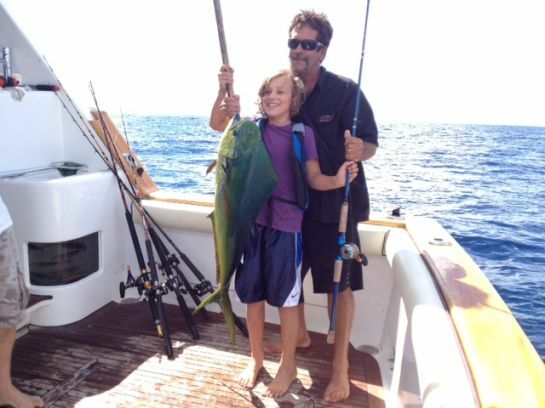 There was a drop off for some Sport Boats on catching Yellowfin Tuna, a few Do Dos, with a few kelp Paddies loaded with the small Yellowtail and some bigger models. 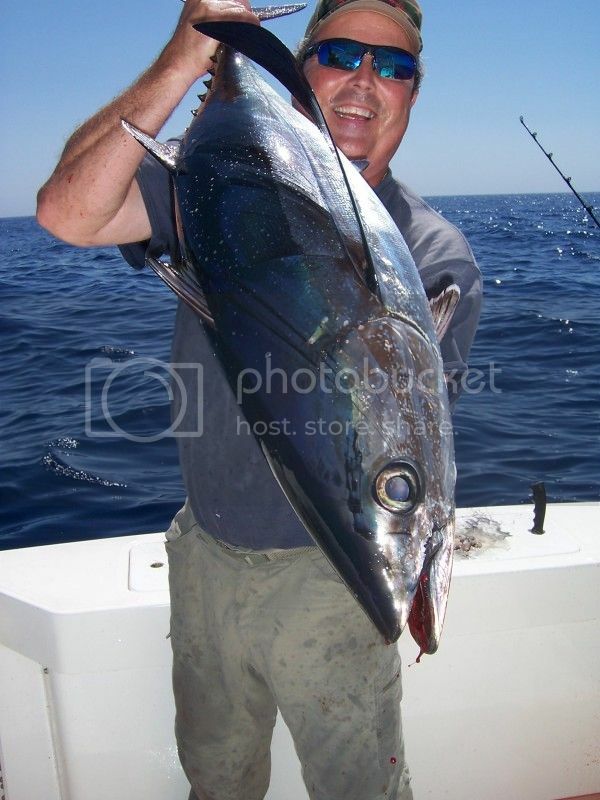 Only an occasional few Bluefin Tuna were found, and the same goes for the Albacore. The 1.5 day trips did far better than single day trips, while 2 day and 3 day trips usually ended up with limits of Tuna to 60 pounds. 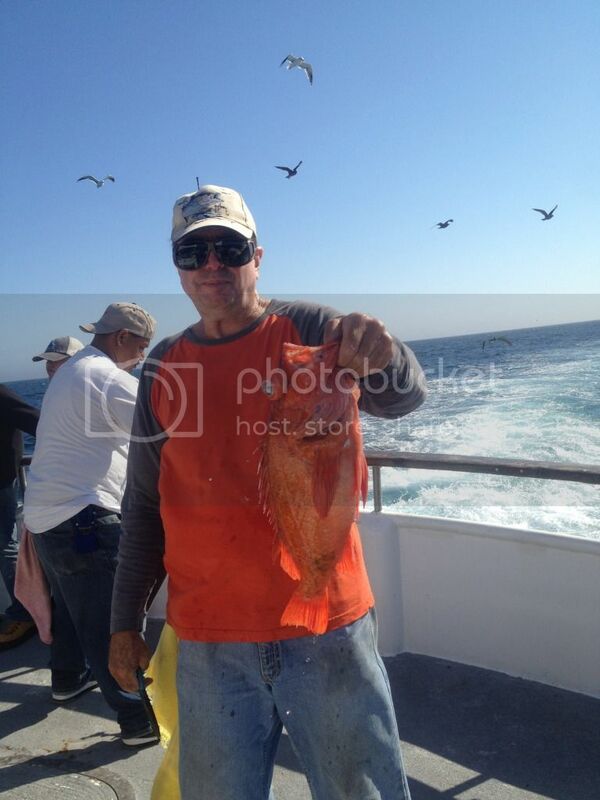 A few private boaters braved the nasty seas fishing down at the 1010 Trench, some 65 miles south of Point Loma. If they found the right Kelp Paddy they enjoyed a Bonanza on catching multiple species. Mostly only the bigger boats ventured as far south as the D220 and west to the 213 Banks. 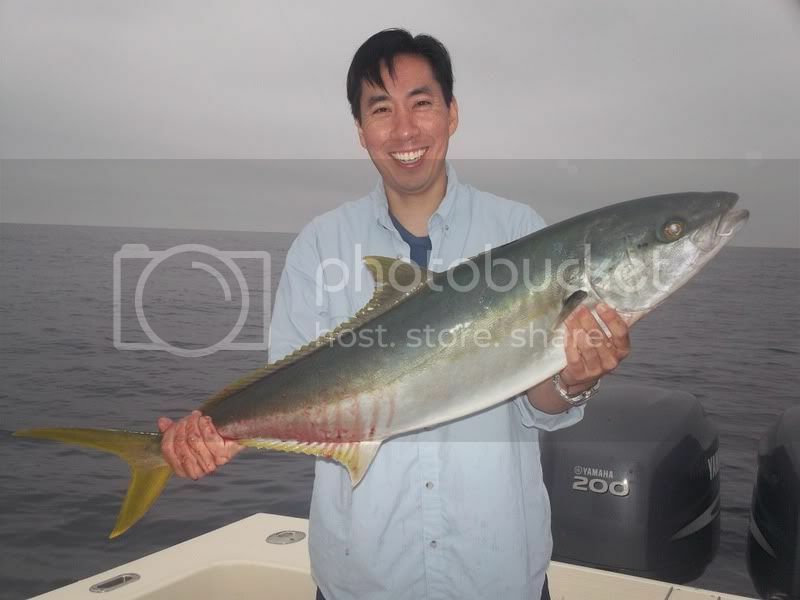 The inshore banks, 302, 371 and 425 triangle are still yielding mostly Rat Yellowtail, with a few Dorado, and not much in the way of any Tuna this close to shore. 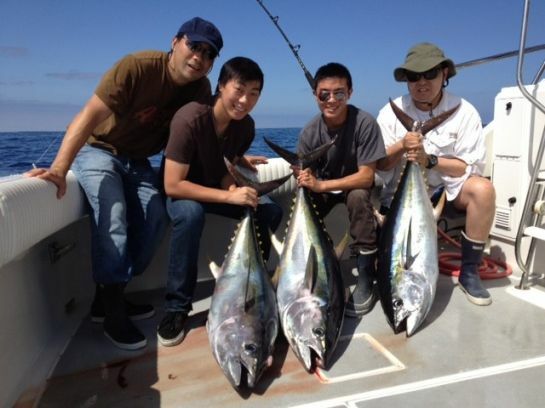 The Hidden Bank yielded a few Yellowfin Tuna on the troll and around the Kelp Paddies, however, no large schools were found. 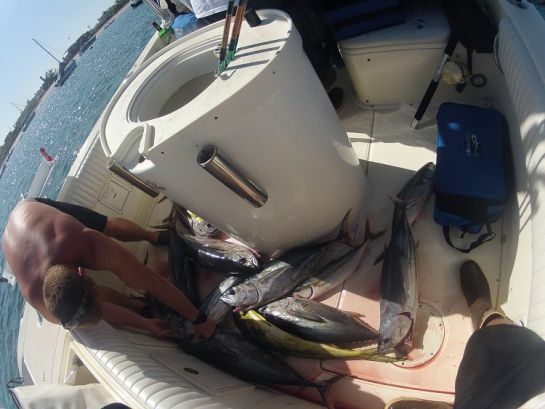 The weather improved during the week and limits of Yellowfin Tuna again became the rule. Unfortunately the weather forecasted for Saturday through early next week calls for windy conditions again. 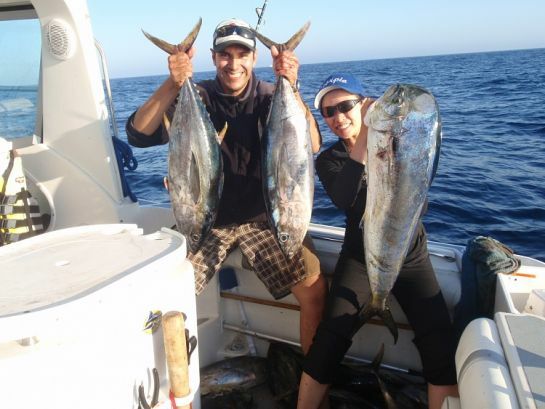 The Toronado out of Pierpoint Landing ran a trip on Friday, 09-28-12 and caught 1 Bluefin Tuna, 1 Yellowfin Tuna, 27 Yellowtail and 10 Dorado. 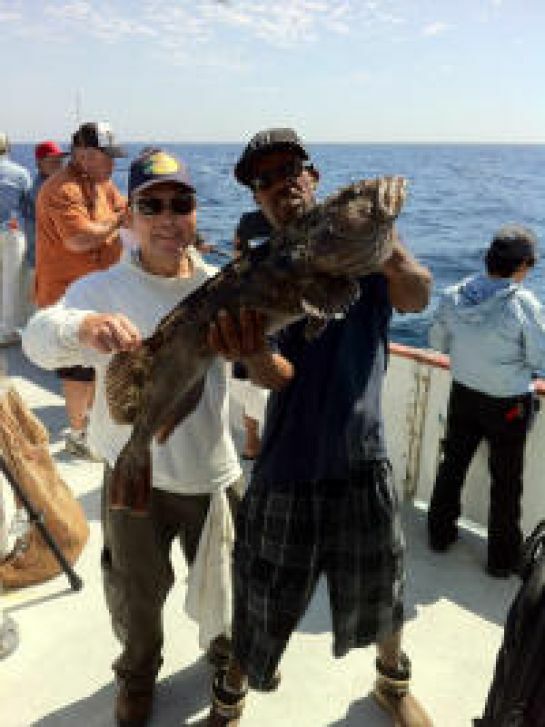 In Santa Monica the ½ day boat Redondo Special had a decent day on their Saturday, 09-29-12 trip catching 1 White Seabass, 17 Calico Bass, 3 Sheephead, 24 Rockfish, 3 Lingcod, 1 Sculpin, 7 Perch and 2 Cabazon. 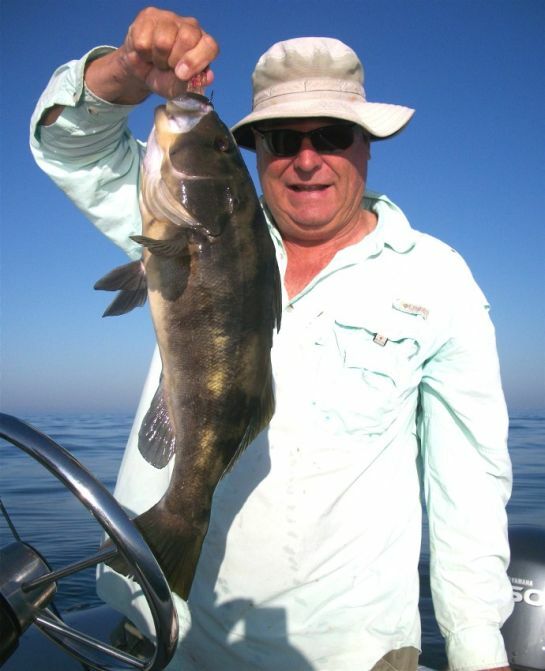 Out of San Pedro, the ½ day boat Monte Carlo had decent afternoon, Monday, 10-01-12 catching 3 Sheephead, 66 Bocaccio, 167 Rockfish, 8 Sculpin, 45 Sand Dab and 46 Red Snapper. 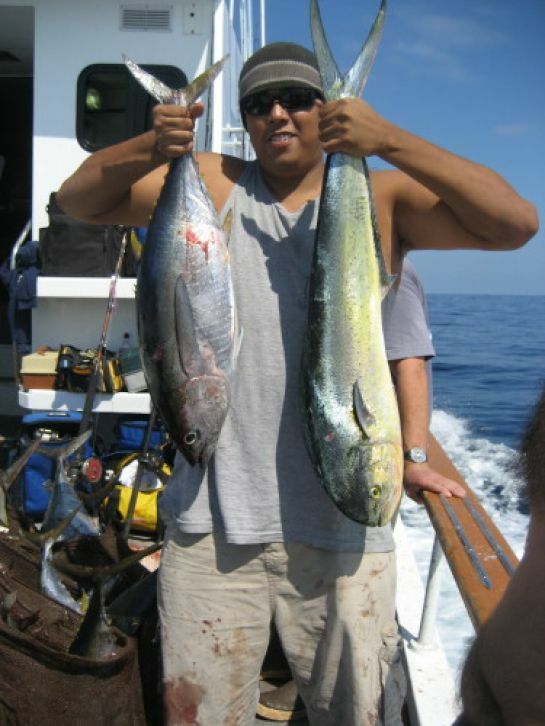 Out of Newport Beach, the Amigo fished on Saturday, 09-29-12 catching 2 Bluefin Tuna, 1 Yellowfin Tuna, 5 Albacore Tuna, 58 Yellowtail and 3 Dorado. Twilight fishing: The Freelance fished Sunday evening, 09-30-12 and caught 1 Calico Bass, 5 Sand Bass, 17 Rockfish, 74 Sculpin and 3 Sargo . 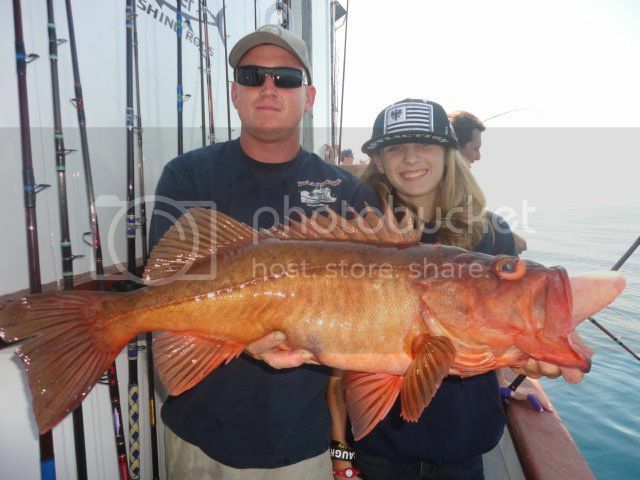 The Nautilus fished on Saturday, 09-29-12 and caught 6 Calico Bass, 7 Sand Bass, 17 Rockfish, 80 Sculpin and 2 Cabazon. The Sport King had a good day at the Island on Wednesday, 10-03-12, catching 75 Calico Bass, 24 Sheephead, 12 Whitefish, 11 Rockfish, 1 Bonito, 102 Perch and 12 Red Snapper. The Pursuit out of 22nd St. Landing, ran to the Island on Wednesday, 10-03-12, with 40 anglers catching 33 Calico Bass,35 Sheephead, 30 Whitefish,40 Rockfish, 404 Perch and 11 Sargo. 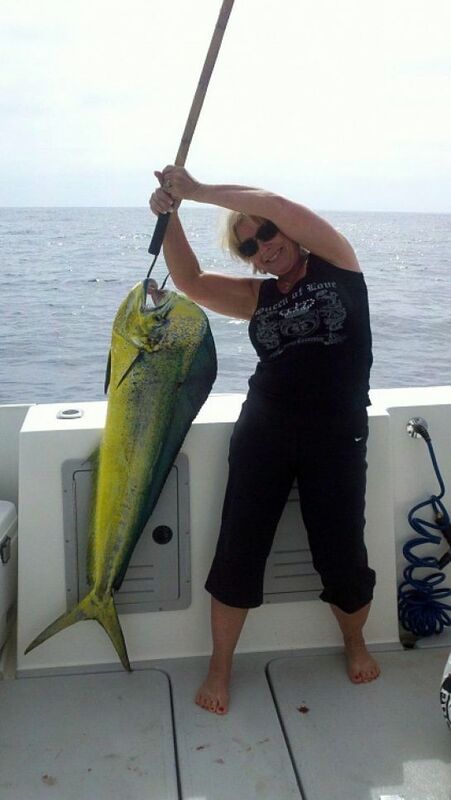 The Fury out of Dana Wharf fished on Saturday, 09-29-12 with 7 anglers catching 24 Yellowtail, 19 Calico Bass and 1 Sheephead. 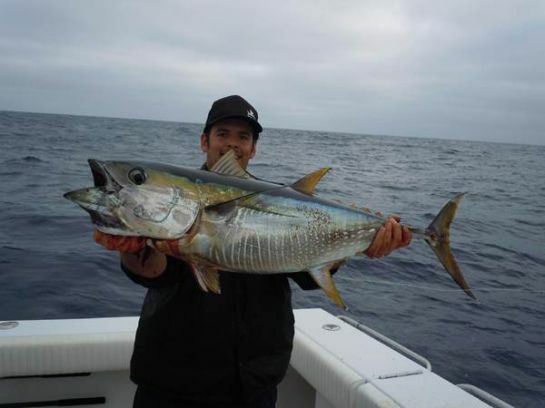 Down South-San Diego and good ole Mexico!No recent reports about the Yellowtail fishing at the Coronado Islands, which has been very good for private boaters. 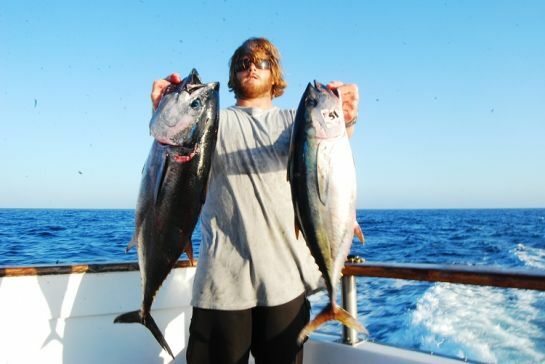 The ¾ day boats are running offshore to catch mostly Yellowtail and Dorado, as the Tuna are a bit far south to run to. 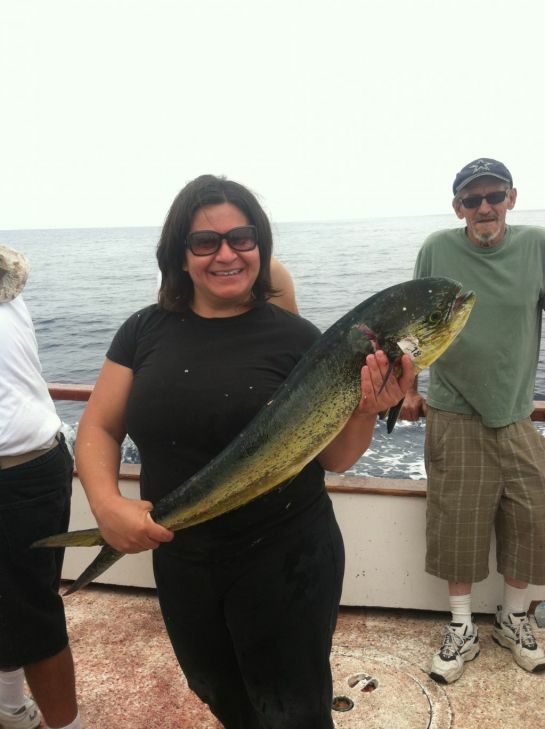 The ¾ day boat San Diego out of Seaforth Landing caught 125 Yellowtail and 4 Dorado on their Thursday, 10-04-12 trip. 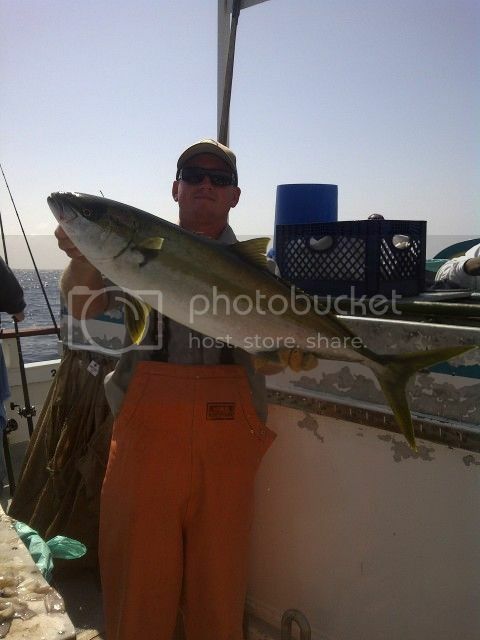 The Mission Belle headed out on Wednesday, 10-03-12, and caught 95 Yellowtail and 12 Dorado. 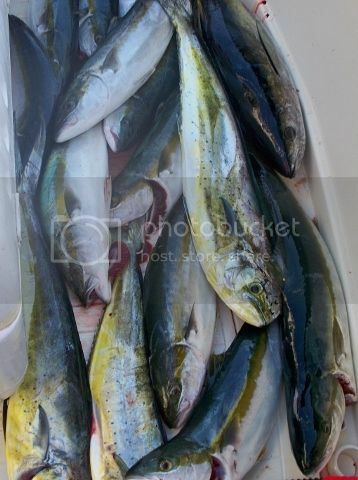 The ¾ day boat Malahini caught 71 Yellowtail and 5 Dorado on their trip on Wednesday, 10-03-12. The weather forecast for both Saturday and Sunday looks to be quite breezy for the offshore runs. Always check the latest forecast before leaving the dock. 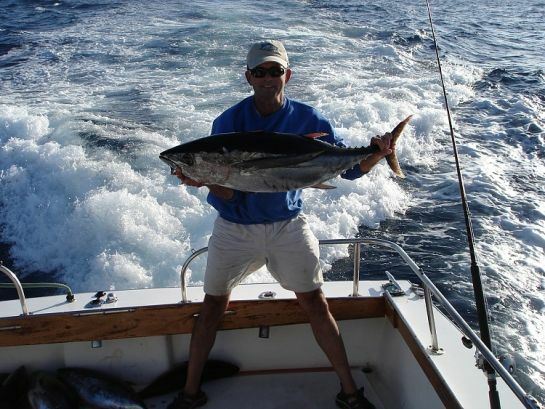 Fishing has been just short of sensational Offshore with most boats, private and Sport Boats catching limits of Yellowfin Tuna, then add some Bluefin Tuna, along with lots of Yellowtail and Dorado. if you run the distance of 60 to 75 miles. If you find the right Kelp Paddy, you could soon realize the Bonanza of all four species. 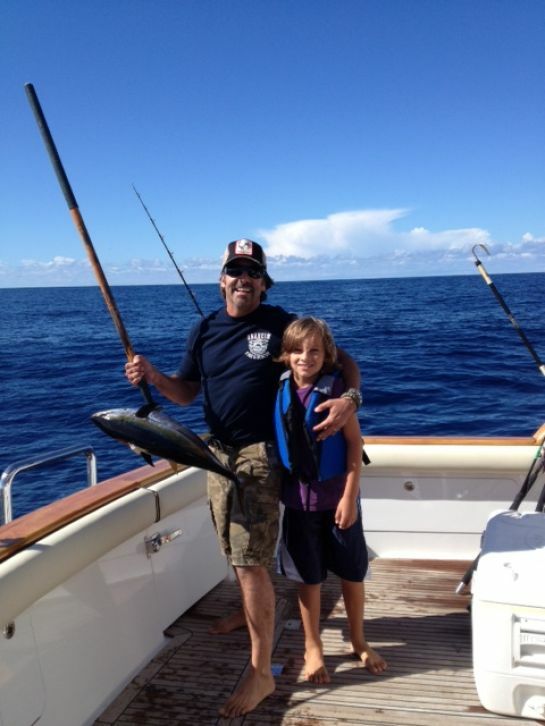 Adding to the thrill on a few trips is finding big Albacore to 40 pounds. The Sport Boat industry has needed this late season run, after several very lean years, where many boats exchanged hands, and some excellent captains left the area. 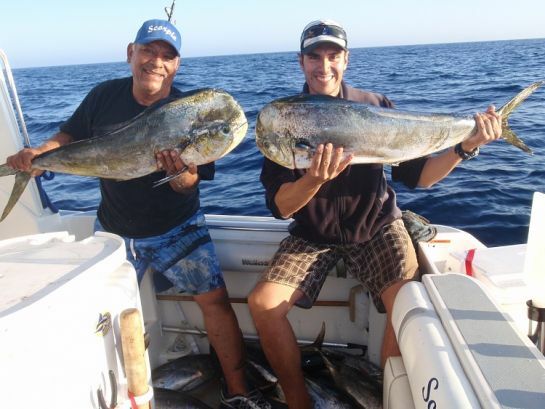 Private boaters have also feasted this year on shorter runs locally for Yellowtail and Dorado, while longer runs have provided a great mix of Tuna and Tails. 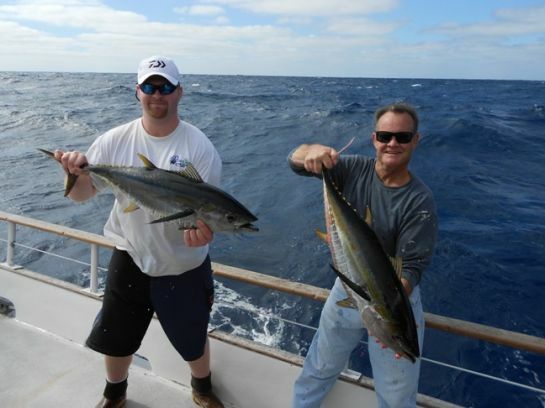 On Friday, 09-28-12 most boats called in with full limits of Yellowfin Tuna for the day, plus a nice complement of Yellowtail and Dorado. I know everyone is hopeful the fishing season will extend into November, I sure do? Considering Hurricane Miriam is pushing more warm water up from the Baja Coast, that wish might be granted. Meanwhile this storm is going to put the kabash on this weekend's fishing with high surf and winds, negating my planned repeat to last Sunday's wide open bite on a private boat. 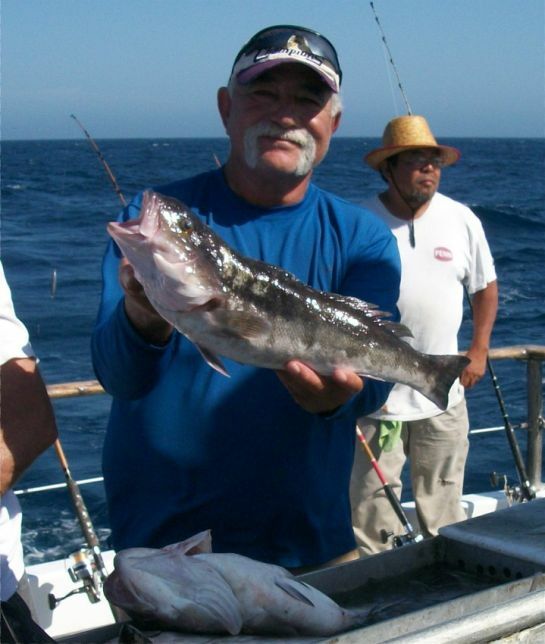 The open water fishing will still be accomplished, however, with the winds and heavier swells, finding Kelp Paddies will be a challenge. Locally there are still few and far between days where kelp paddies are found holding fish, and that is if you can find one? Yet occasionally the Mother Load Kelp Paddy is found. 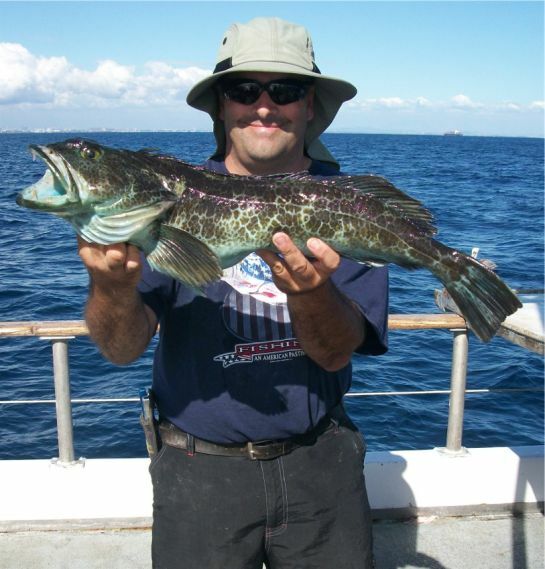 Do Dos and Tails remain the primary target of the ¾ day and one day boats locally, who head offshore rather than settle for Sculpin and Rockfishing. On some days the ¾ day boats out of Newport Beach and Long Beach found the right kelp paddy. 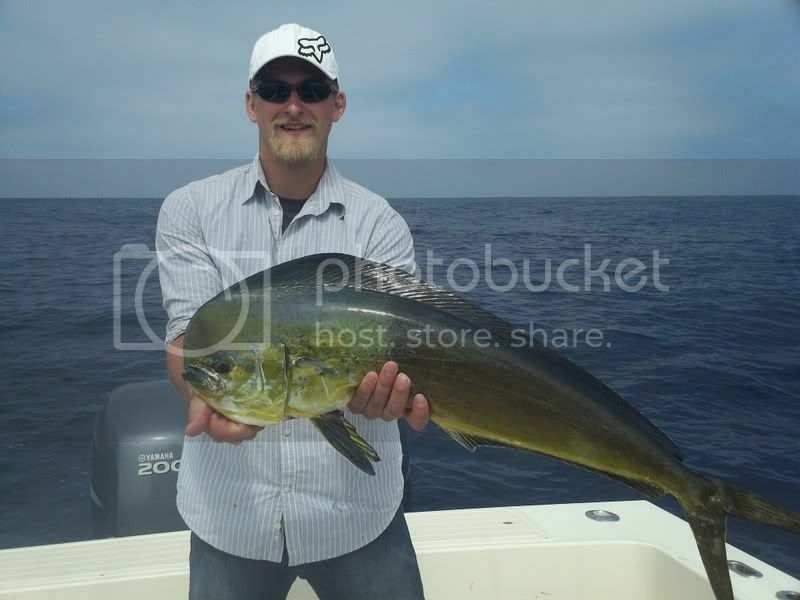 For example the Freelance on Monday, 09-24-12 caught 33 Yellowtail and 2 Dorado. 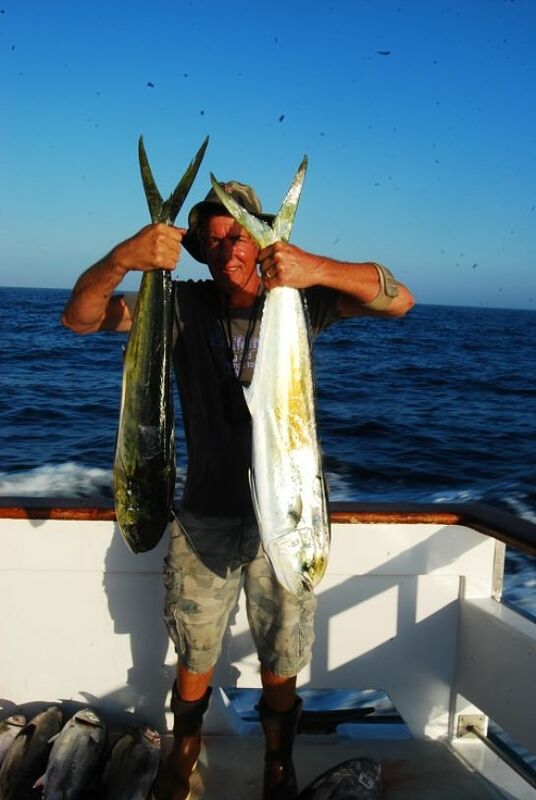 Out of the same landing as the Freelance the Bongo's III on Wednesday, 09-26-12, caught 45 Yellowtail and 3 Dorado. 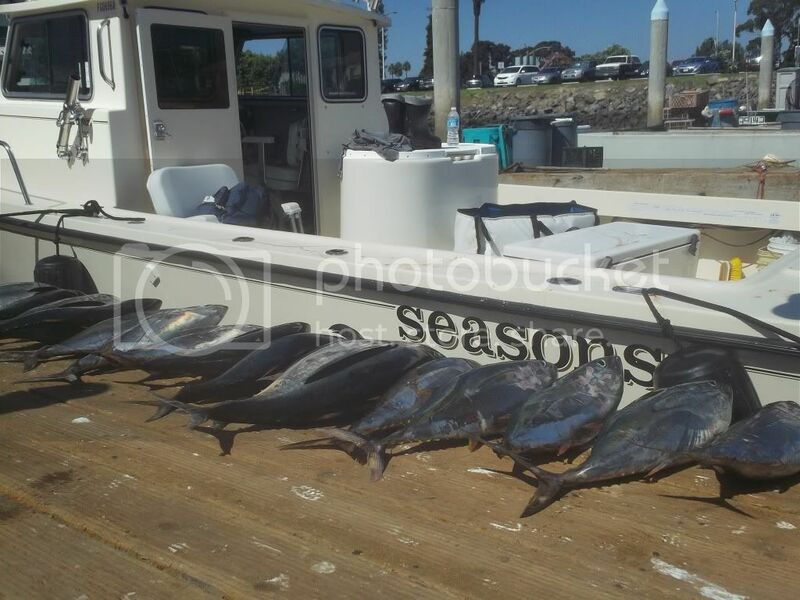 The Cortez Bank has been yielding solid counts of Bluefin Tuna and the following boats have been having great success on their 1.5 day trips. 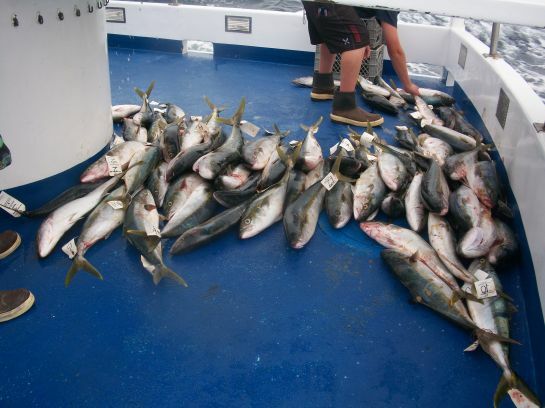 The Toronado out of Pierpoint Landing ran a 1.5 day trip returning on Monday, 09-24-12, and caught 44 Bluefin Tuna, 8 Yellowfin Tuna, 1 Calico Bass, 45 Sheephead, 60 Whitefish, 100 Rockfish and 100 Bonito. The Freedom out of 22nd St. Landing ran a 1.5 day trip and caught 115 Bluefin Tuna, 31 Sheephead, 65 Whitefish, 25 Rockfish and 10 Sculpin returning on Monday, 09-24-12. 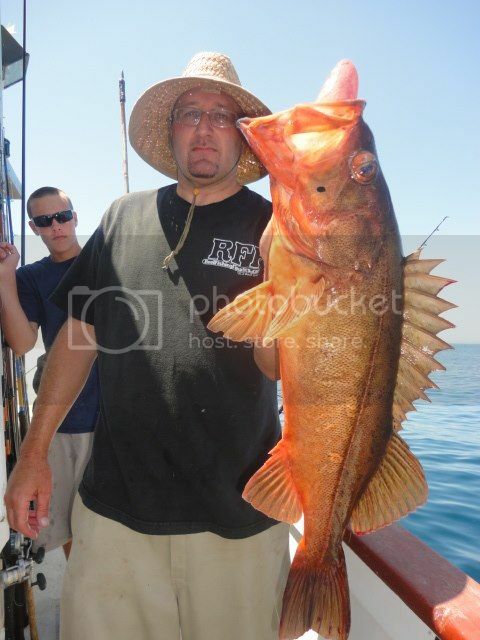 Locally the targeted fishing remains Sculpin and Rockfish, with a few Bass mixed in. 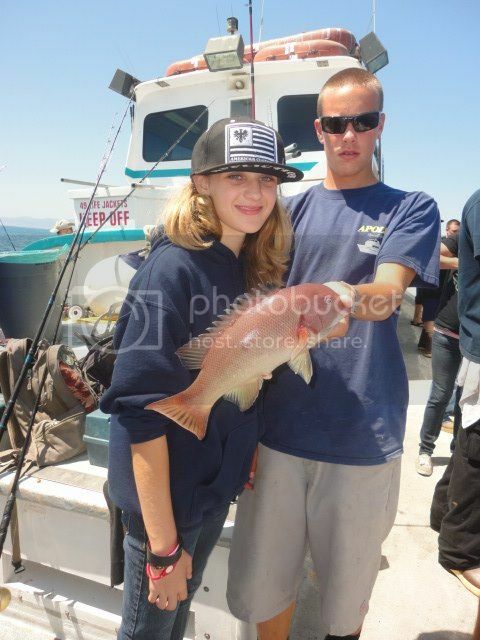 In Santa Monica the ½ day boat Redondo Special had a good day on their Thursday, 09-27-12 pm trip catching 3 White Seabass, 21 Calico Bass, 3 Sand Bass, 8 Sheephead, 11 Rockfish, 2 Sculpin, 15 Perch and 1 Cabazon. Also on their Monday trip they caught limits of Calico Bass (70) for 7 anglers. 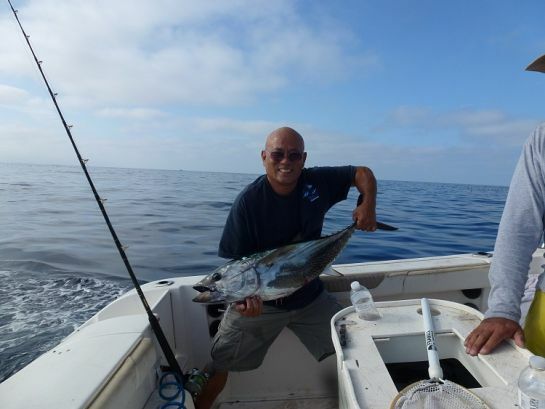 Out of Newport Beach, the Amigo ended a 2-day trip on Sunday, 09-23-12 catching 2 Bluefin Tuna, 1 Yellowfin Tuna, 5 Albacore Tuna, 58 Yellowtail and 3 Dorado. Twilight fishing: The Freelance fished Sunday evening, 09-23-12 and caught 5 Calico Bass, 2 Sand Bass, 24 Rockfish and 175 Sculpin. The Sport King had a good day at the Island on Tuesday, 09-25-12 catching 115 Calico Bass, 13 Sheephead, 10 Rockfish and 40 Perch. The Pursuit out of 22nd St. 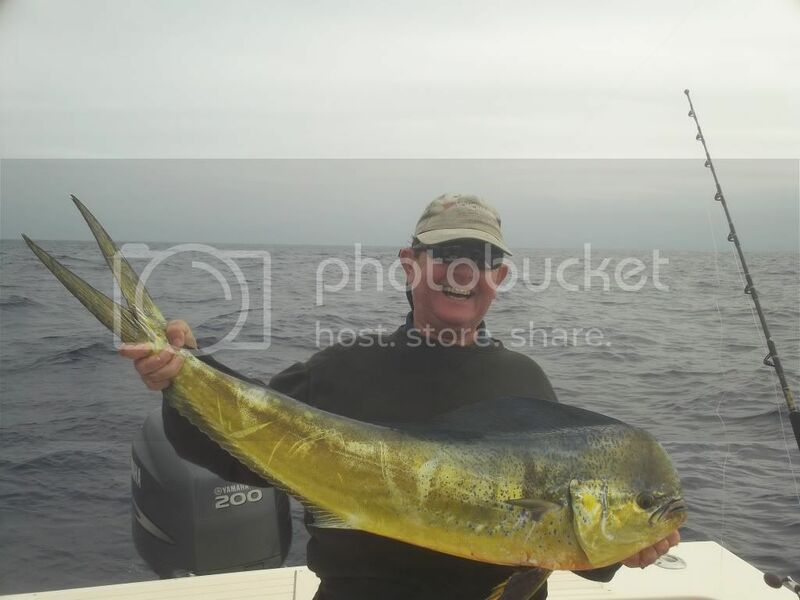 Landing, ran to the Island on Sunday, 09-23-12, with 29 anglers catching 1 Yellowtail, 54 Calico Bass, 33 Sheephead, 30 Whitefish, 50 Bocaccio, 103 Rockfish, 158 Perch and 10 Red Snapper. The Fury out of Dana Wharf fished on Tuesday, 09-25-12 with 21 anglers catching 150 Calico Bass, 13 Barracuda and 2 Sheephead. 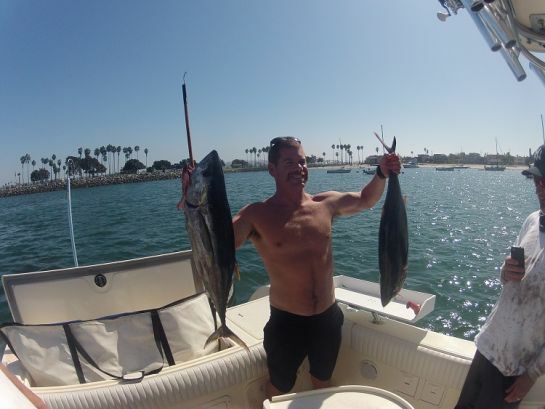 The fishing at the Coronado Islands has been very quiet as of late. 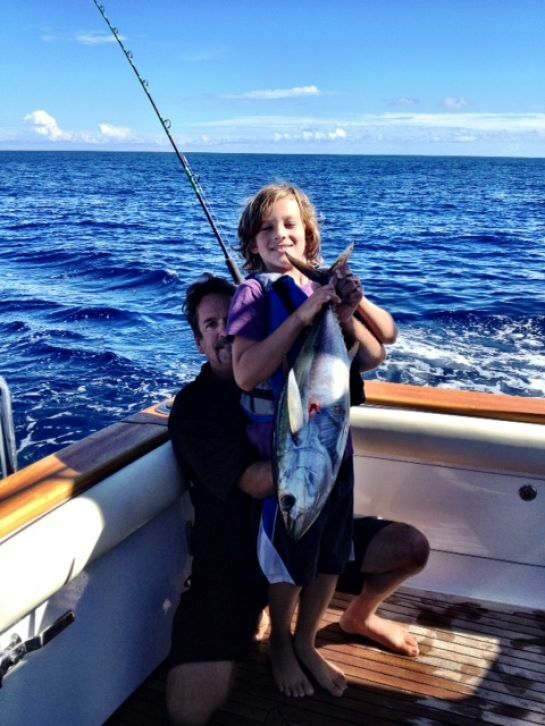 The ¾ day boats are running offshore to catch Tuna and Tails as the Visa mess is still up in the air? 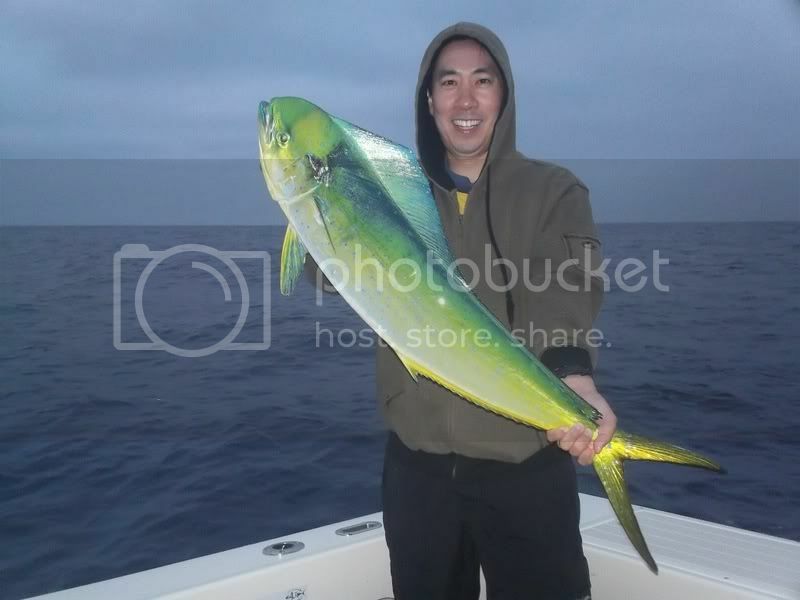 The last few days the ¾ day boats have found limit style fishing on the Dorado also with lots of Yellowtail being caught offshore on the kelp Paddies. 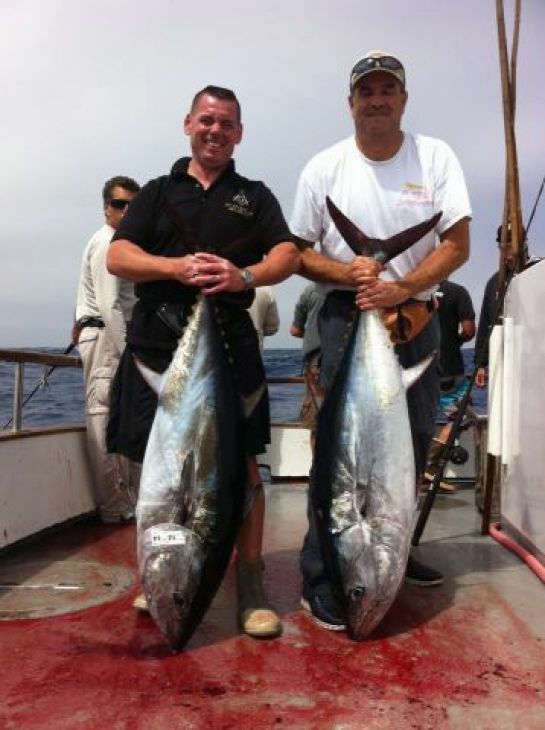 The ¾ day boat San Diego out of Seaforth Landing caught 5 Bluefin Tuna, 8 Yellowfin Tuna, 41 Yellowtail and 7 Dorado on their Tuesday, 09-25-12 trip. 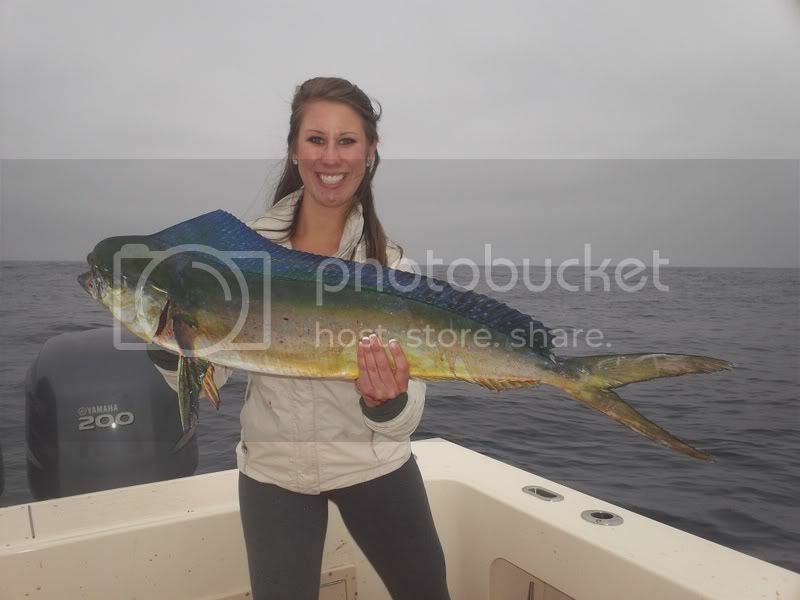 The Mission Belle headed out on Tuesday, 09-25-12, and caught 67 Yellowtail and 20 Dorado. 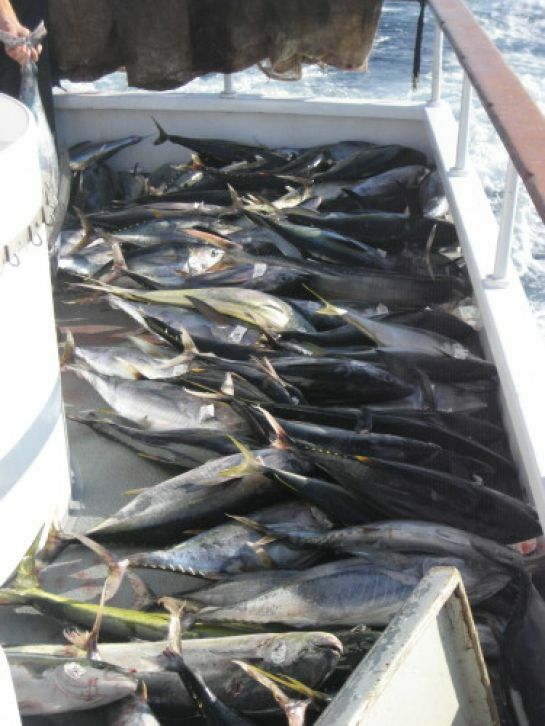 The ¾ day boat Malahini caught 1 Bluefin Tuna, 59 Yellowtail and 5 Dorado on their trip on Thursday, 09-27-12. 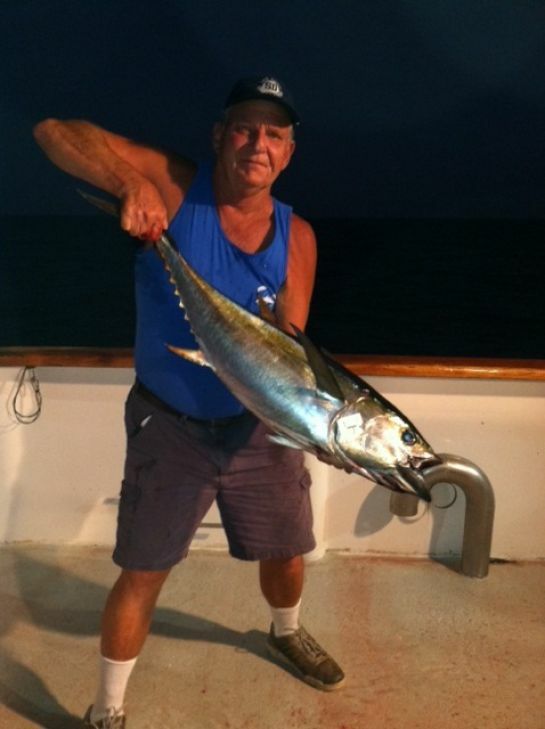 And the beat goes on, as the Offshore action remained very steady, with good scores on Yellowfin Tuna, lots of Do Dos and Tails, occasional good schools of Bluefin Tuna of which some were the tackle buster 60 to 100 pound variety, with some decent scores on Albacore. Open water jig strikes were common and the Kelp Paddy fishing could turn into a smorgasbord of all of the above species off of the one Kelp. 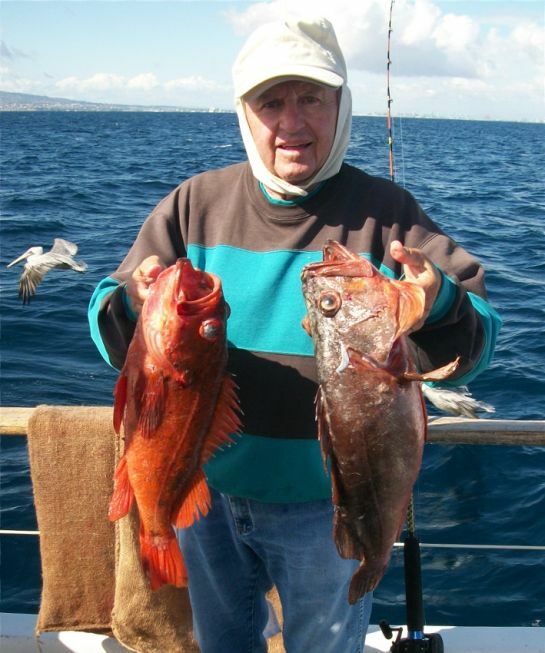 In the last several weeks the private boater has enjoyed great fishing down at the 1010 Trench, some 65 miles south of Point Loma. 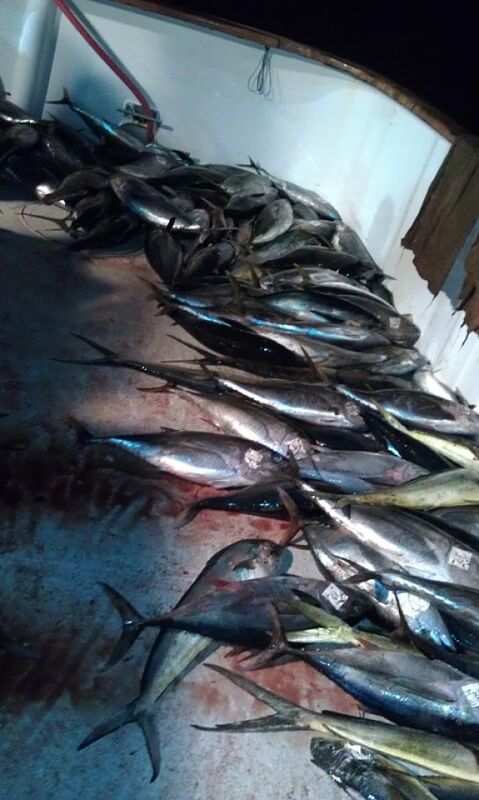 Tuna were also found at the D220 and 213 Banks. 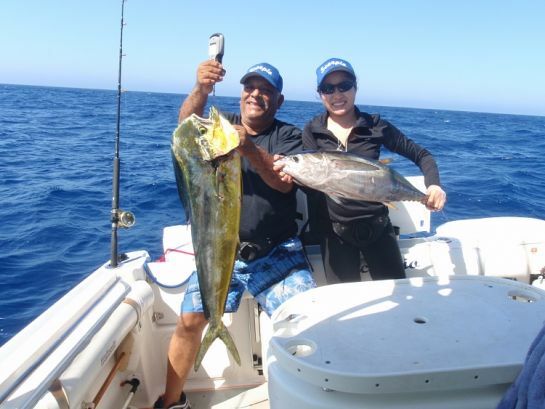 The inshore banks, Hidden, 302, 371 and 425 are still yielding mostly Rat Yellowtail and a few Dorado, yet not much in the way of any Tuna. Water temps range anywhere from the high 60's on up to 75 degrees, depending upon the area. 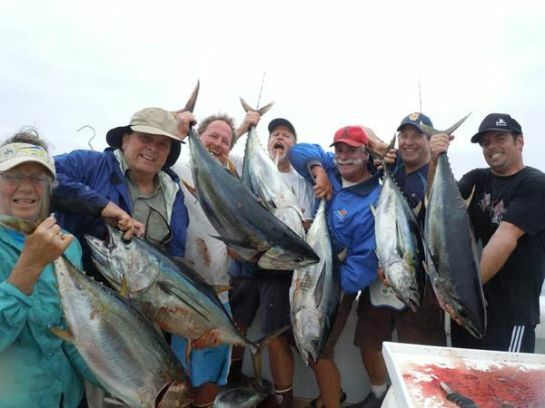 The Top Gun 80 returned Monday, 09-17-12 from a whale of a 2.5 day trip with 25 anglers catching 45 Bluefin Tuna, 250 Yellowfin Tuna (full 2-day limits), 4 Albacore Tuna, 50 Yellowtail and 50 Dorado. 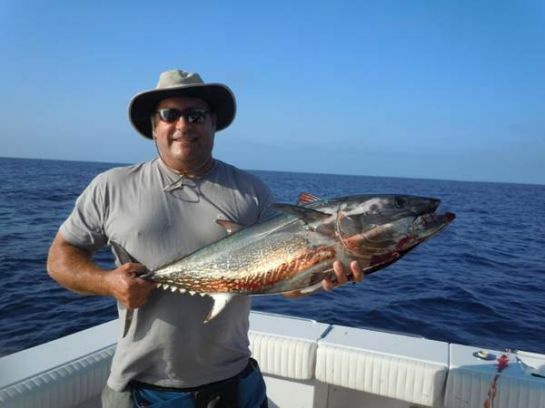 According to angler Ted his one day trip on the Pride Monday, 09-17-12 was wide open on the Yellowfin Tuna, (limits), with a few Dorado and Yellowtail mixed in. 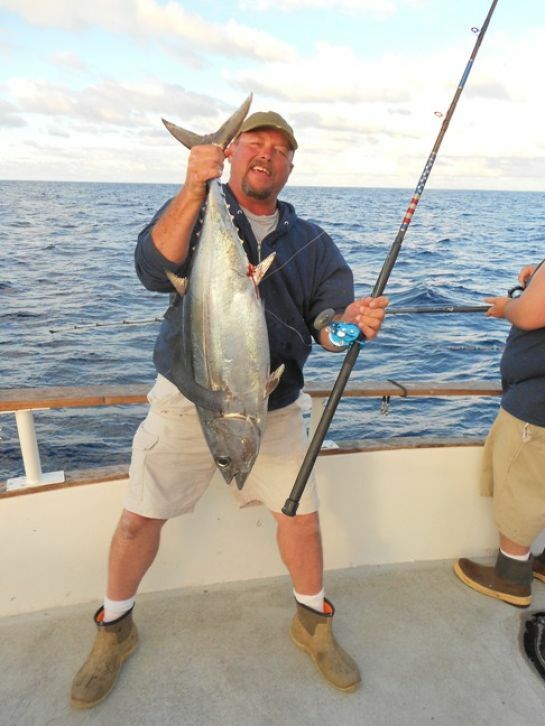 The Aztec, returned from a successful 1.5 day trip Monday, 09-17-12 with a great mix of fish: 9 Bluefin Tuna, 33 Yellowfin Tuna, 16 Albacore Tuna, 120 Yellowtail and 14 Dorado. 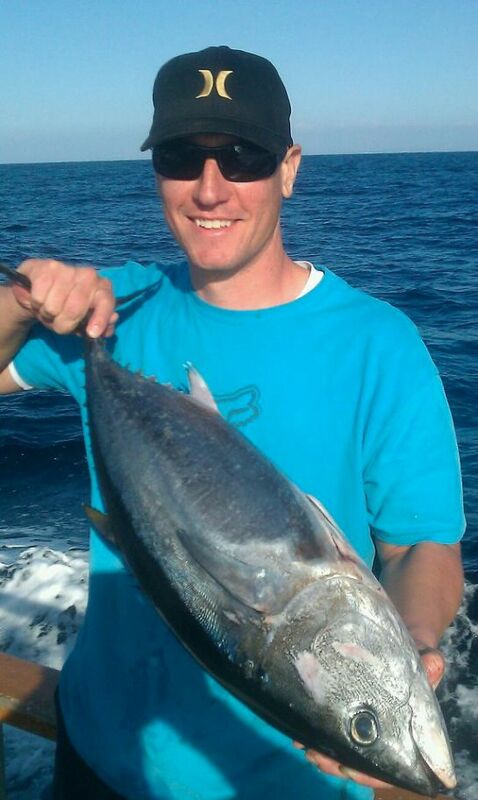 To get in on the Tuna, it is necessary to book a 1.5 to 2 day trip out of these northern landings to reach the fish. 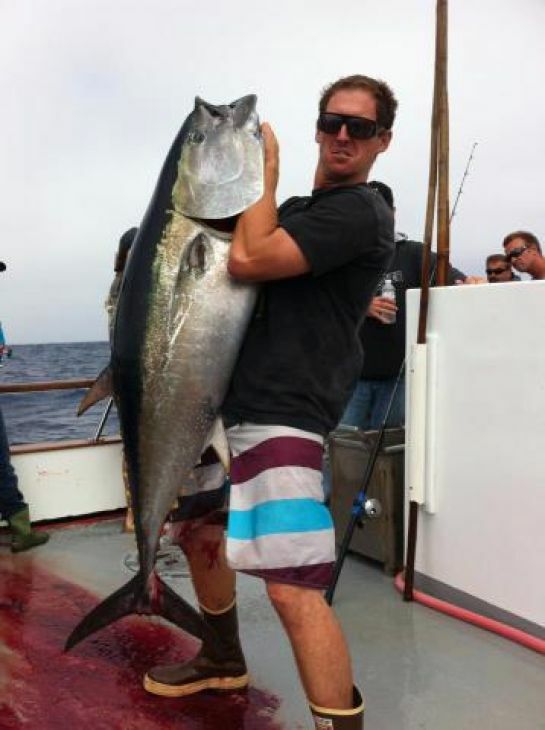 There has been a small snap on the Yellowtail and White Seabass at Catalina Island this week. 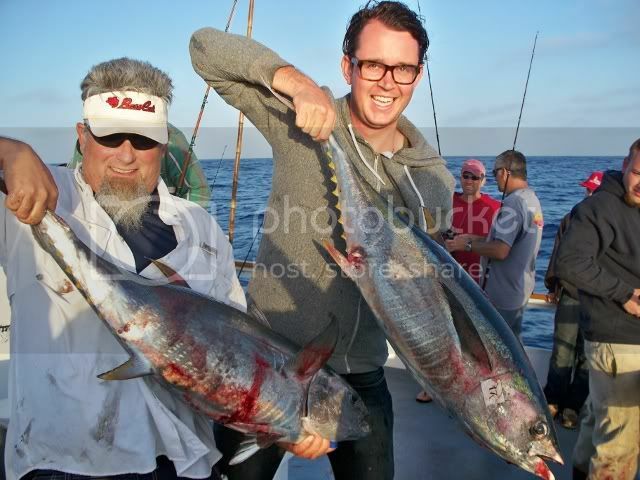 The Toronado out of Pierpoint Landing ran a trip on Sunday, 09-16-12 and caught 3 Bluefin Tuna, 91 Yellowtail and 6 Dorado. The Freedom out of 22nd St. 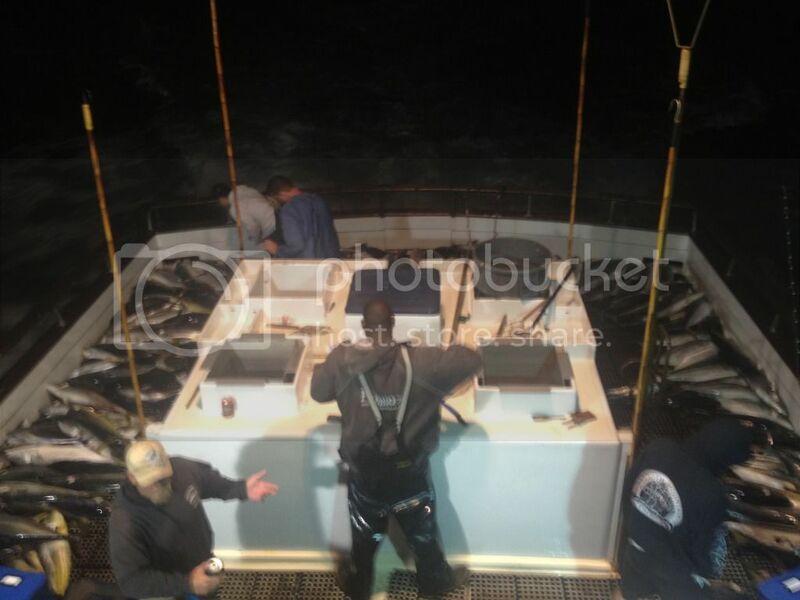 Landing caught 62 Bluefin Tuna on their trip Monday, 09-17-12. 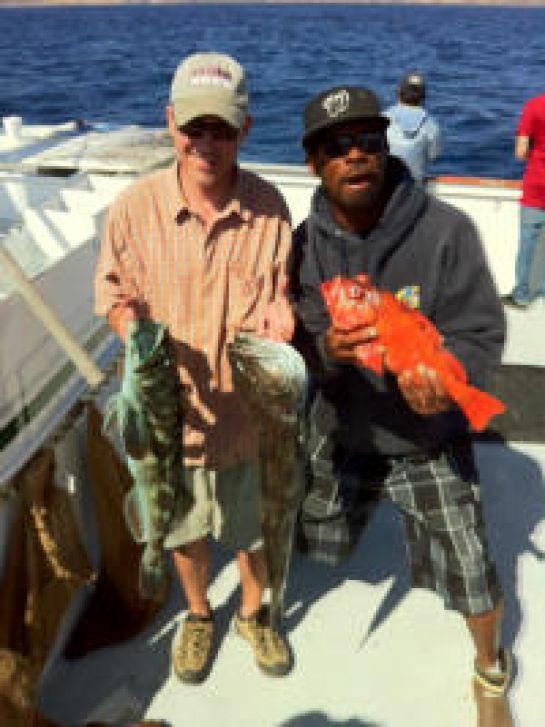 In Santa Monica the ½ day boat Redondo Special had a decent day on their Saturday, 09-5-12 pm trip catching 2 Yellowtail, 5 Calico Bass, 1 Sand Bass, 2 Sheephead, 9 Rockfish, 3 Sculpin and 11 Perch. 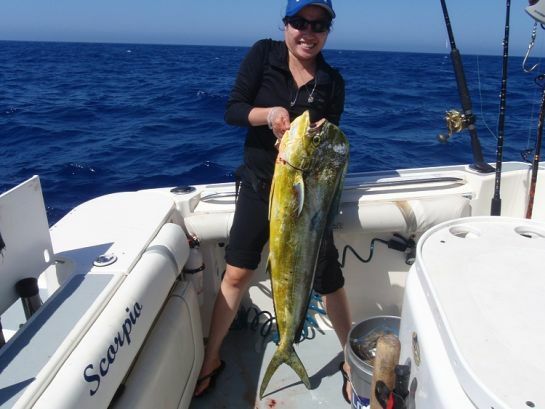 Out of Dana Point, the Fury ran an offshore trip on Tuesday, 09-18-12 and caught 1 Yellowtail, 30 Dorado, 48 Calico Bass and 5 Perch. 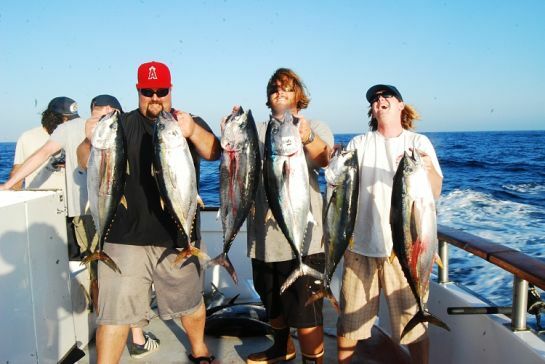 Out of Newport Beach, the Amigo ended a 2-day trip on Saturday, 09-15-12 catching 13 Bluefin Tuna, 1 Yellowfin Tuna, 25 Albacore Tuna, 30 Yellowtail and 15 Dorado for 14 anglers. 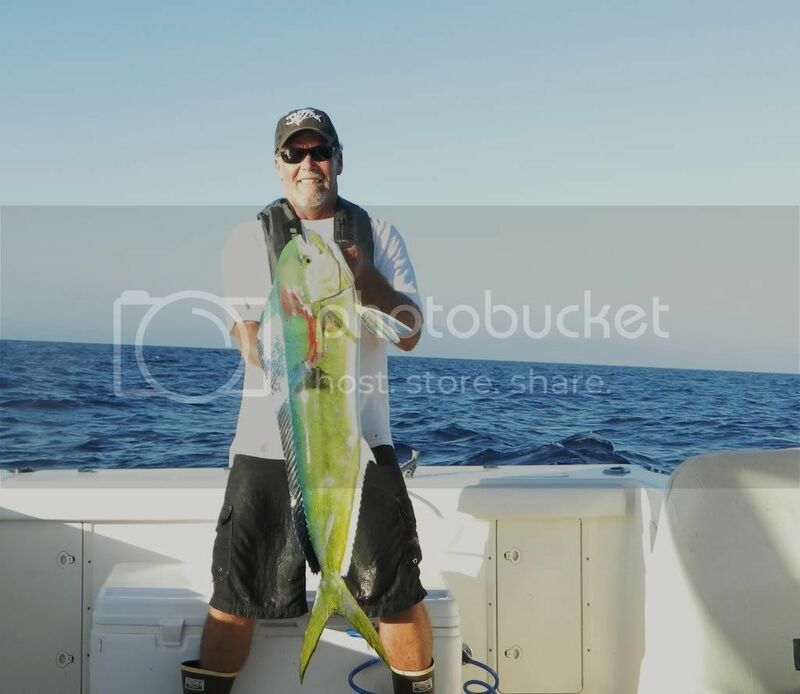 The Freelance fished offshore Tuesday, 09-18-12 and caught 14 Dorado, 3 Calico Bass, 2 Sheephead, 2 Rockfish, 2 Sculpin and 45 Perch. Twilight fishing: The Freelance fished Sunday evening, 09-16-12 and caught 8 Calico Bass, 20 Rockfish, 120 Sculpin and 1 Cabazon. Most boats have discontinued twilight trips as the demand has dwindled? 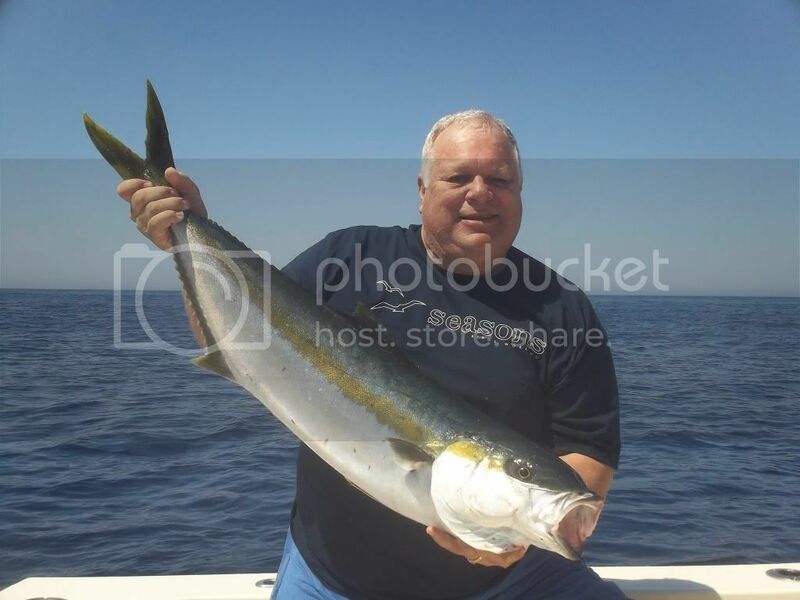 The Sport King had a good day at the Island on Monday, 09-17-12 catching 4 Yellowtail, 42 Calico Bass, 15 Barracuda, 12 Sheephead and 110 Perch. The Pursuit out of 22nd St. Landing, ran to the Island on Wednesday, 09-19-12, with 40 anglers catching 11 White Seabass, 100 Calico Bass, 31 Sheephead and 106 Perch. The Fury out of Dana Wharf fished on Monday, 09-17-12 with 26 anglers catching 211 Calico Bass, 13 Barracuda, 1 Sheephead and 7 Perch. The Freedom caught 40 Calico Bass, 1 Barracuda, 31 Sheephead, 1 Whitefish, 34 Rockfish, 1 Sculpin and 63 Perch on their Saturday, 09-15-12 trip. 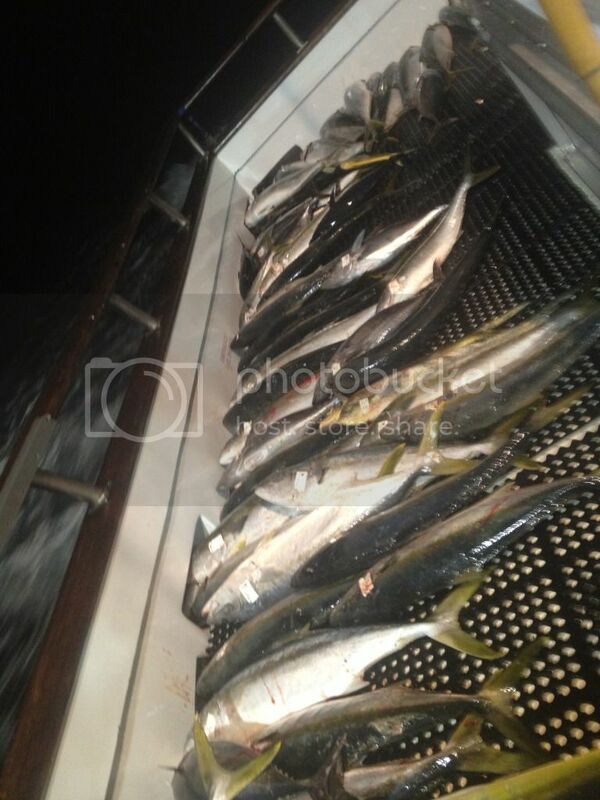 The ¾ day boat San Diego out of Seaforth Landing caught 100 Yellowtail 44 Dorado on their Thursday, 09-20-12 trip. 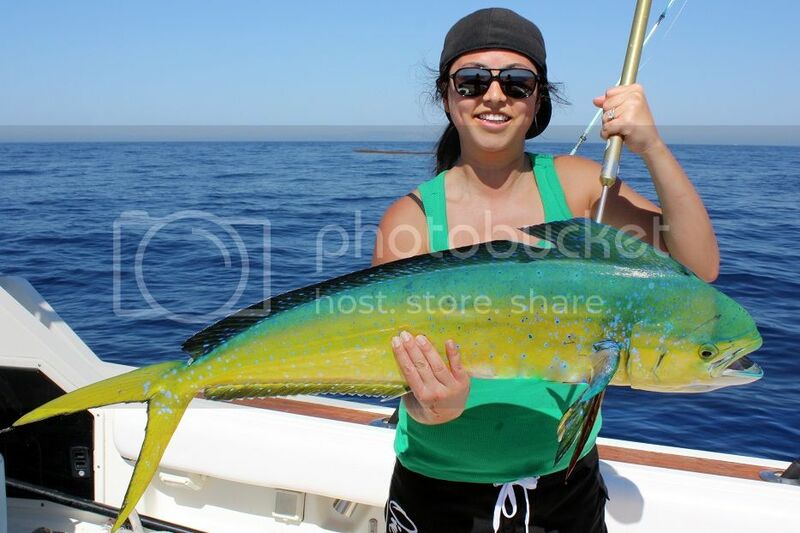 The Mission Belle headed out on Monday, 09-17-12, and caught 80 Yellowtail and 21 Dorado. 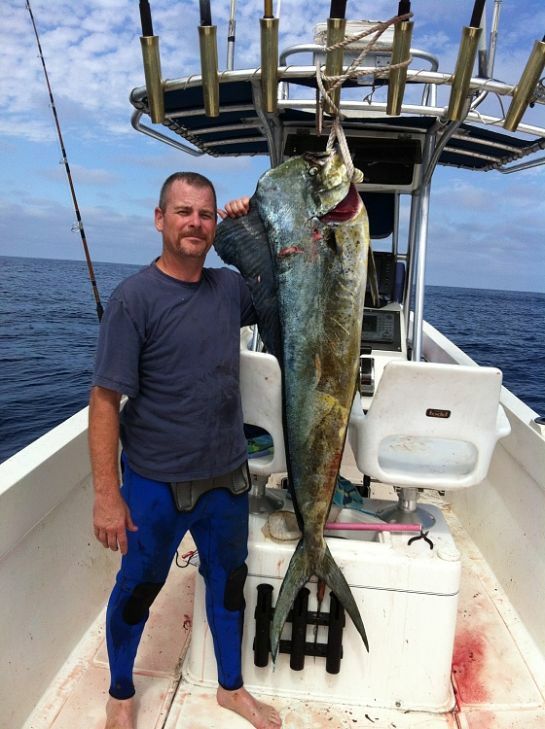 The ¾ day boat Malahini caught 45 Yellowtail and 22 Dorado on their trip on Thursday, 09-20-12. WeatherThe weather forecast for both Saturday and Sunday looks to be quite nice for the offshore runs. Always check the latest forecast before leaving the dock. 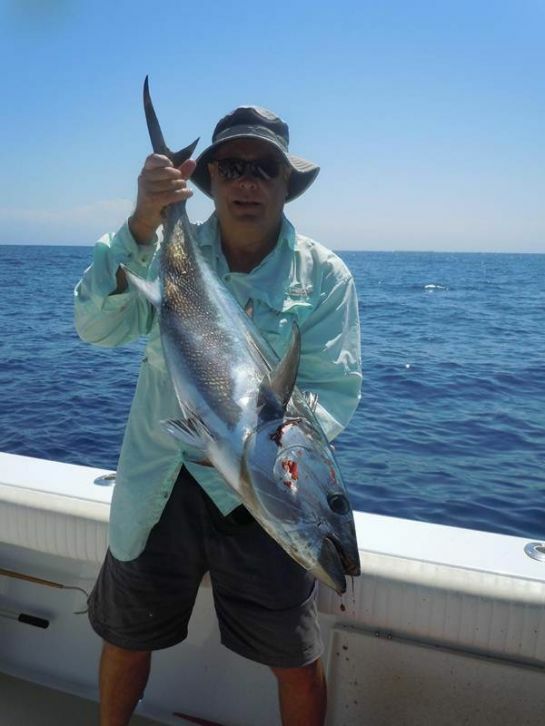 In recent weeks the Private Boater has enjoyed some of the best fishing in three years. 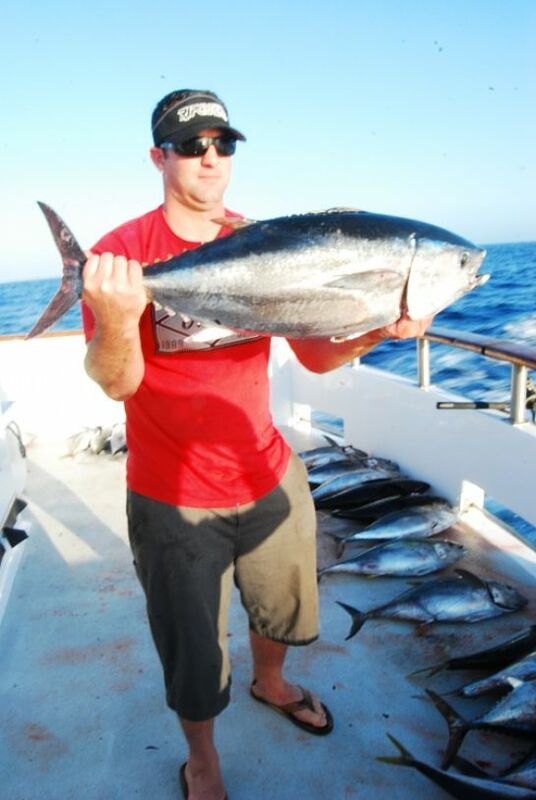 The Offshore action has provided opportunities to catch-Yellowfin Tuna, Bluefin Tuna, Do Dos and Tails. The weather has been exceptional for most of the last two weeks, leading to water temps as high as 75 degrees, yikes, Cabo eat your heart out! 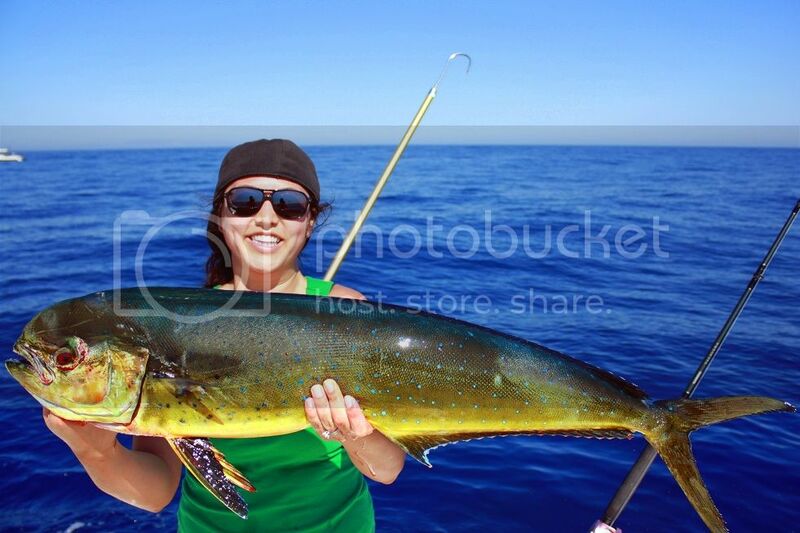 An enormous amount of Dorado (Mahi Mahi), are being seen and caught from 150 miles south of the border to 75 miles north of the border. 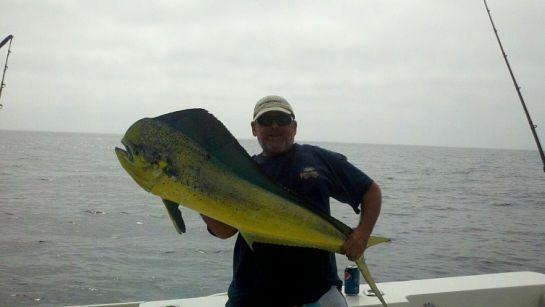 In fact the ½ day boat Patriot caught some Dorado off of Newport Beach recently. 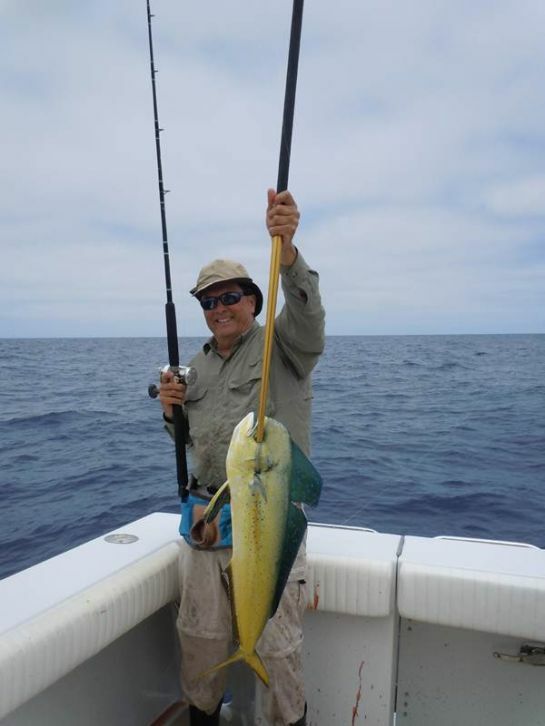 The Yellowtail fishing on the Kelp Paddies have been off the charts in many areas. The secret of successful fishing is finding the Mother Load Kelp Paddy. You find it, and they bite and everyone goes home happy. Locally there are many kelp paddies that are not holding fish, yet there are a bunch of paddies that yield huge results. So don't give up, keep on looking, you may just find that Mother Load Kelp Paddy. Where ever it was caught, it's a keeper? Private boaters have been combing the seas from 50 miles south of the border and all the way up to making runs northwest out of Newport Beach. 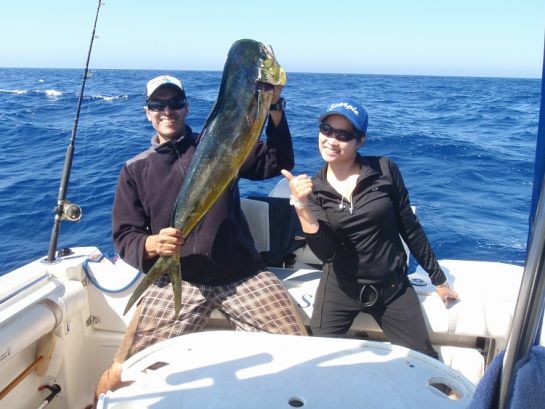 We are all hoping the fish put on a show similar to four years ago, when a run of 10 miles out of either Long Beach or Santa Monica Bay yielded Kelp Paddies loaded with Dorado and Yellowtail. 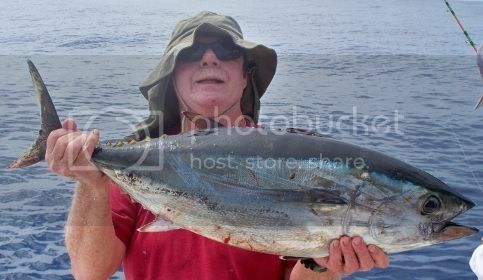 Then the Yellowfin Tuna moved in under the porpoise and it was game on for 30 to 40 pound Tuna. 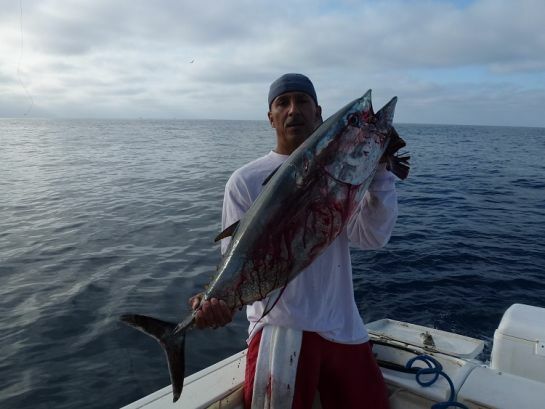 The Aztec, on its latest 1.5 day trip, which will return Friday morning, 08-24-12, caught 36 Yellowtail, 43 Bluefin Tuna, 38 Dorado and 2 Yellowfin Tuna to 45 pounds. 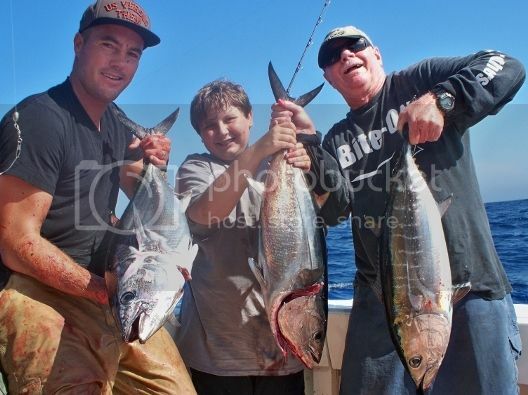 The Toronado out of Pierpoint Landing ran a 1.5 day trip and caught 72 Bluefin Tuna 28 Yellowtail 70 Dorado. The Freedom out of 22nd St. 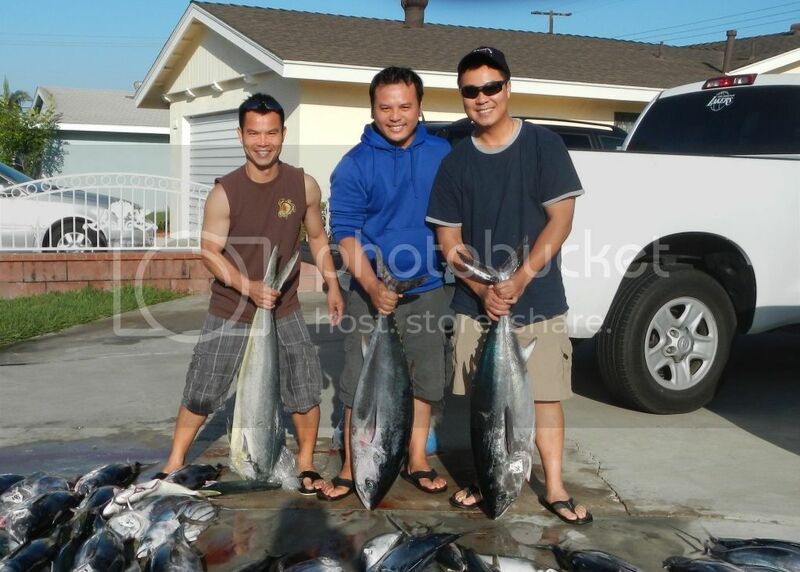 Landing caught 21 Bluefin Tuna, 62 Yellowtail and 132 Dorado on a 2-day trip. 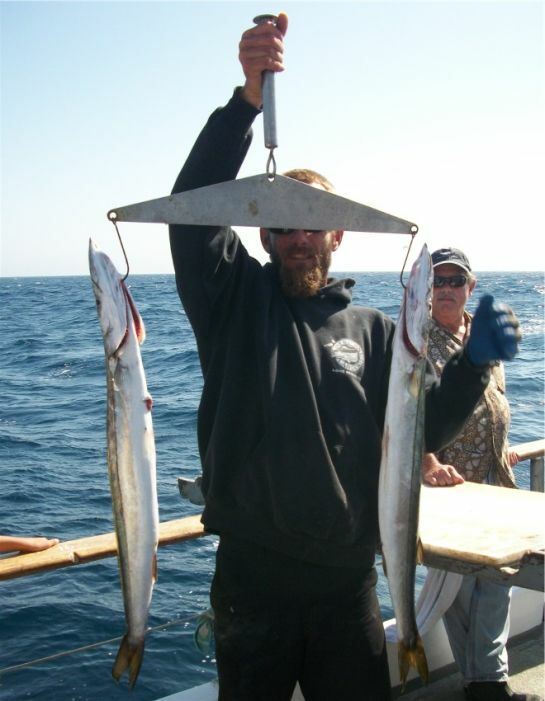 The Enterprise fished on Thursday, 08-23-12, and caught 1 White Seabass, 1 Calico Bass, 122 Sand Bass and 4 Sculpin for only 22 anglers. 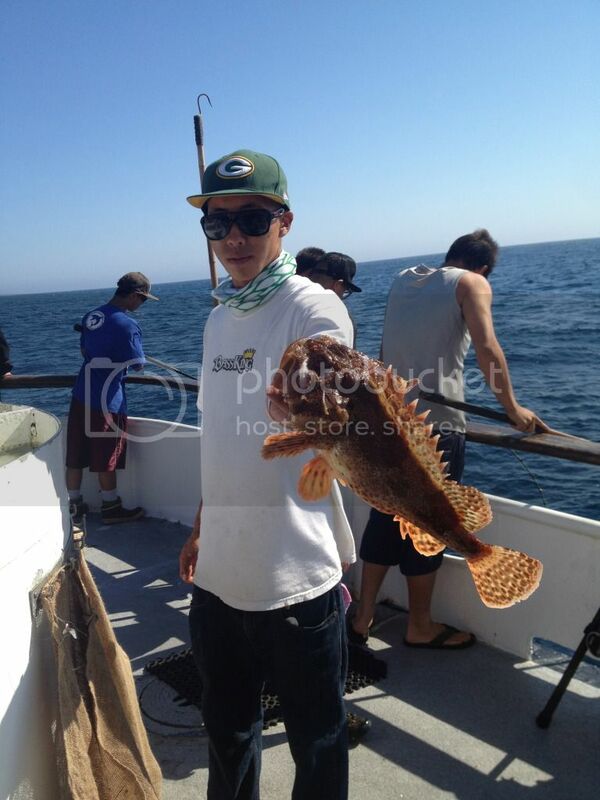 The Freelance fished Sunday evening, 08-19-12 and caught 220 Sculpin and 30 Sand Dab. 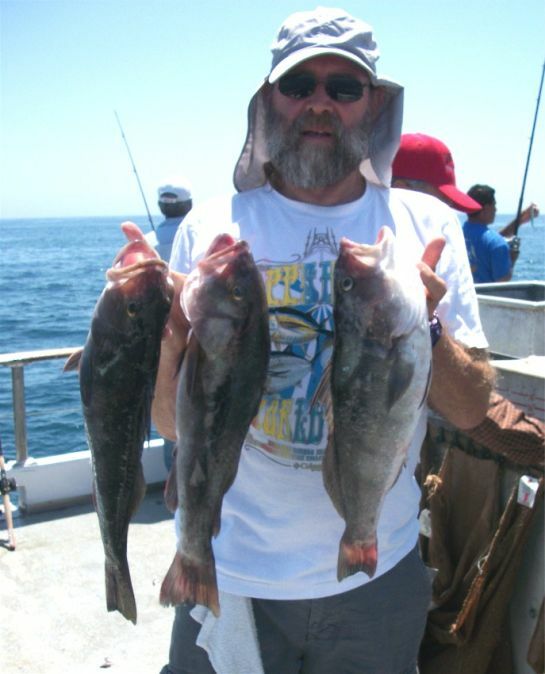 The Southern Cal fished an evening run on Monday, 08-20-12 for 35 Sand Bass and 11 Sculpin for only 11 anglers. 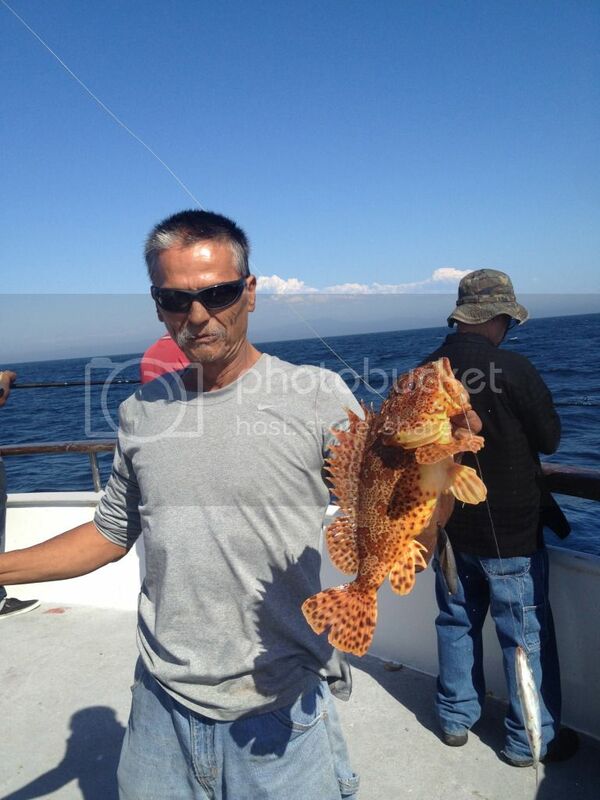 Newport Beach and Dana Point.There has been some excellent Sculpin fishing with some good scores on the Bass. 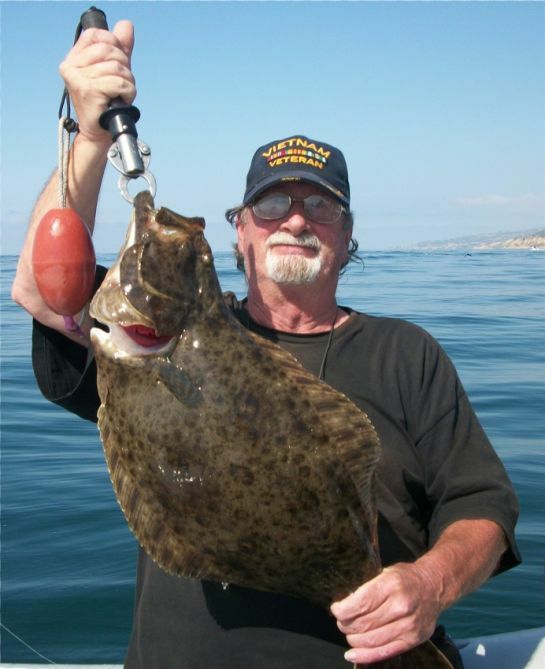 For example the Freelance caught 290 Sculpin and 100 Sand Dab on their ¾ day trip, Sunday, 08-19-12. 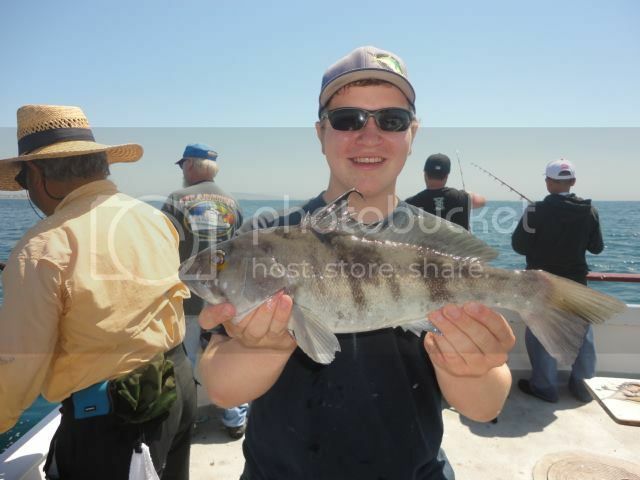 A couple of White Seabass have also shown up in the counts. There was some great Sculpin and Sand Bass fishing during the week, when not targeting the Barracuda which have been MIA most of the week. 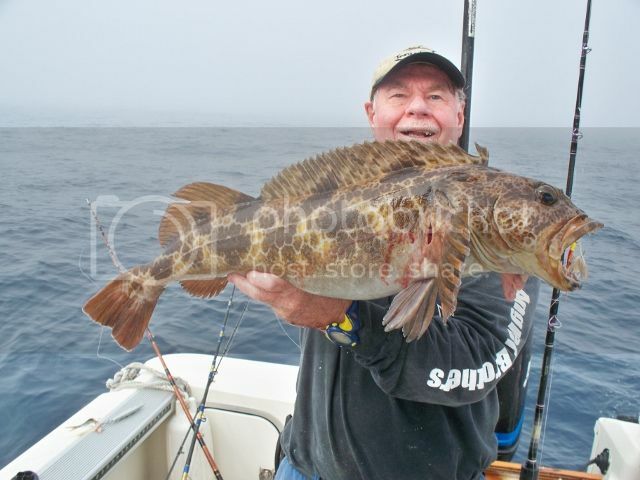 The Victory according to Ron caught easy limits of Sculpin and half limits of Sand Bass on their Wed-08-22-12 trip. 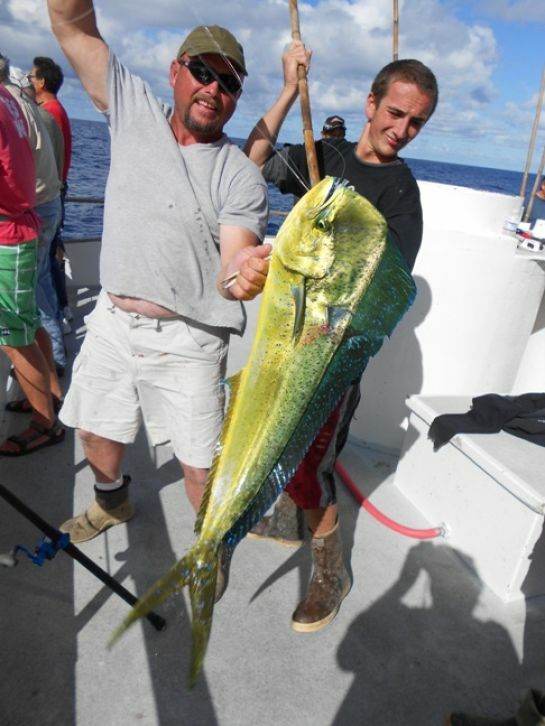 The Freedom is fishing offshore on multi day trips. The Sport King had a great day at the Island on Thursday, 08-23-12 catching 105 Calico Bass, 4 Barracuda, 10 Sheephead and 22 Perch. The Pursuit out of 22nd St. Landing, ran to the Island on Tuesday, 08-21-12, with 30 anglers catching 103 Calico Bass, 4 Barracuda, 10 Sheephead and 55 Perch. 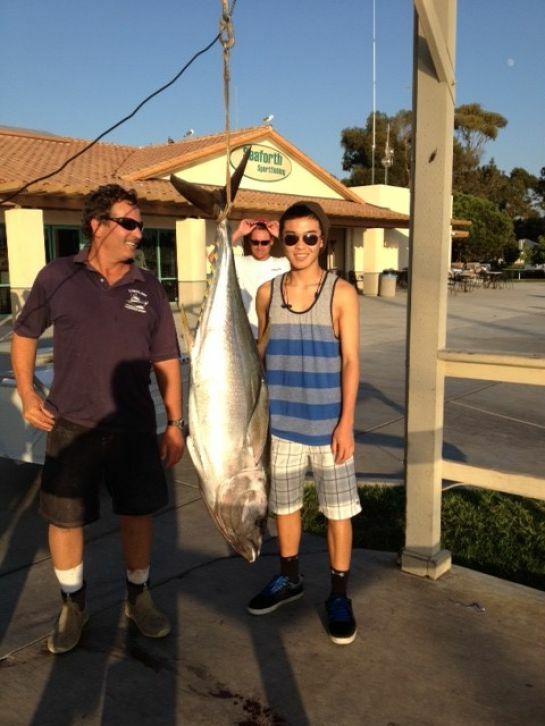 The Fury out of Dana Wharf fished on Tuesday, 08-21-12 with 47 anglers catching 4 Yellowtail, 61 Calico Bass, 2 Sand Bass and 1 Sheephead. 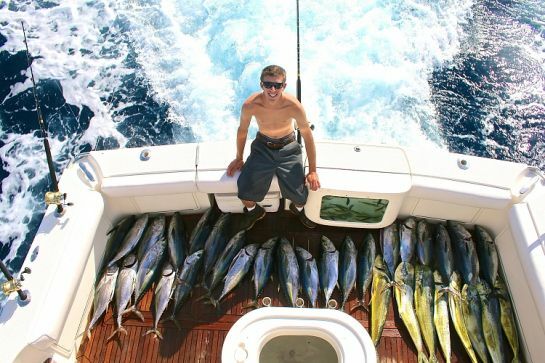 The Yellowtail fishing at the Coronado Islands has been very good for private boaters. 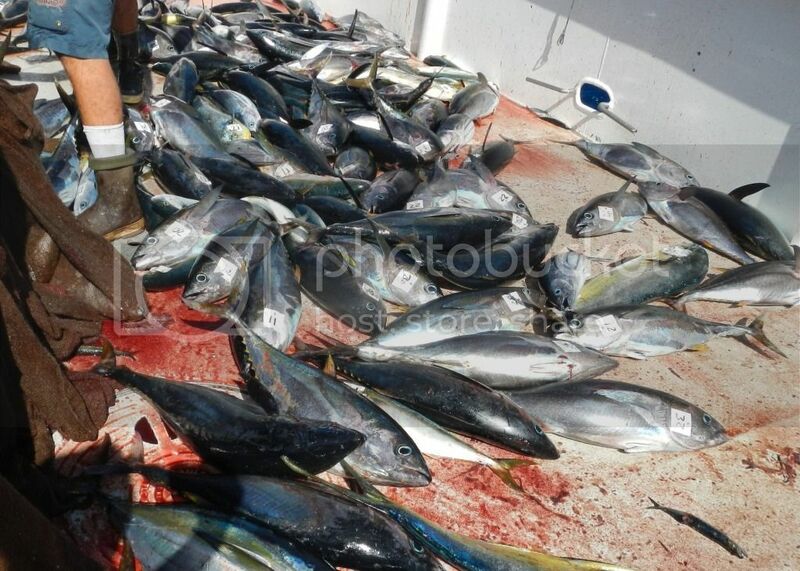 The ¾ day boats are running offshore to catch Tuna and Tails as the Visa mess is still up in the air? 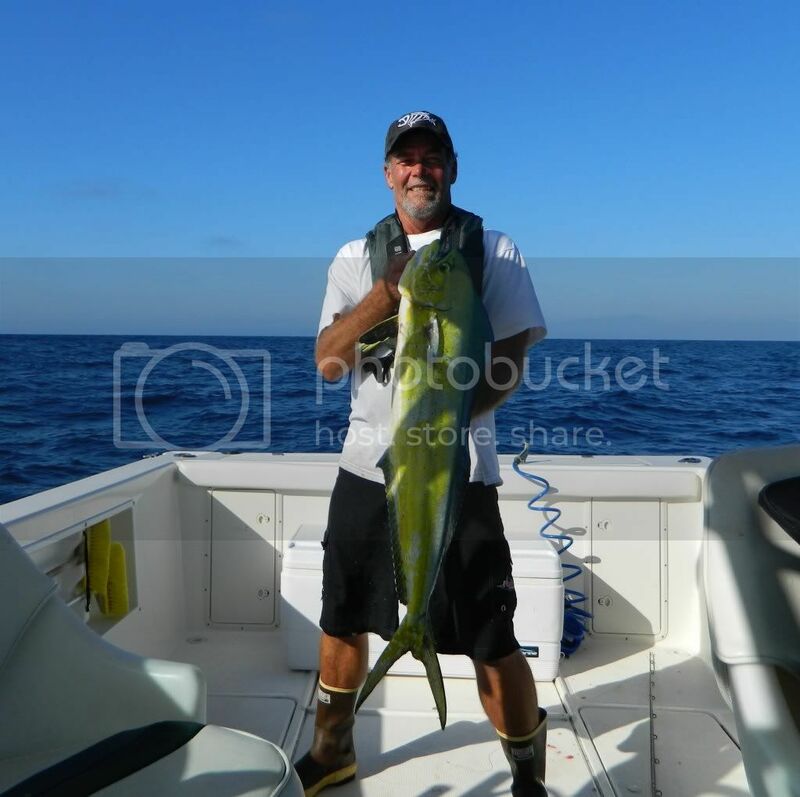 The last few days the ¾ day boats have found limit style fishing on the Dorado with some Yellowtail being caught offshore on the kelp Paddies. 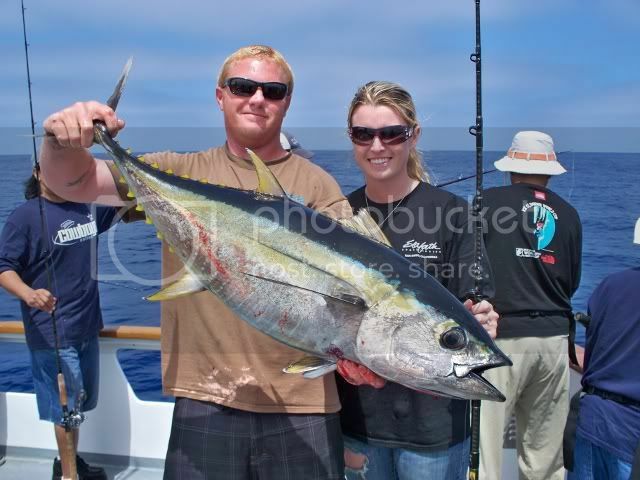 The ¾ day boat San Diego out of Seaforth Landing caught 11 Bluefin Tuna, 3 Yellowtail and 9 Dorado on their Wednesday, 08-22-12 trip. 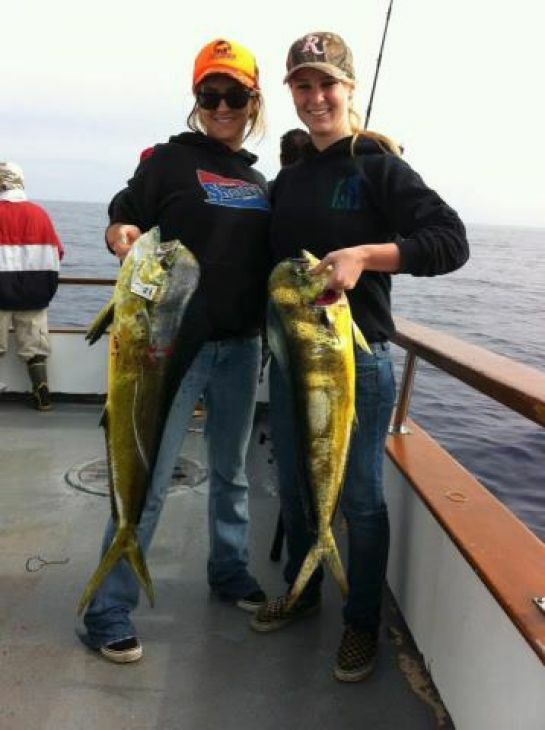 The Mission Belle headed out on Wednesday, 08-22-12, and caught 6 Bluefin Tuna, 8 Yellowtail and 12 Dorado. 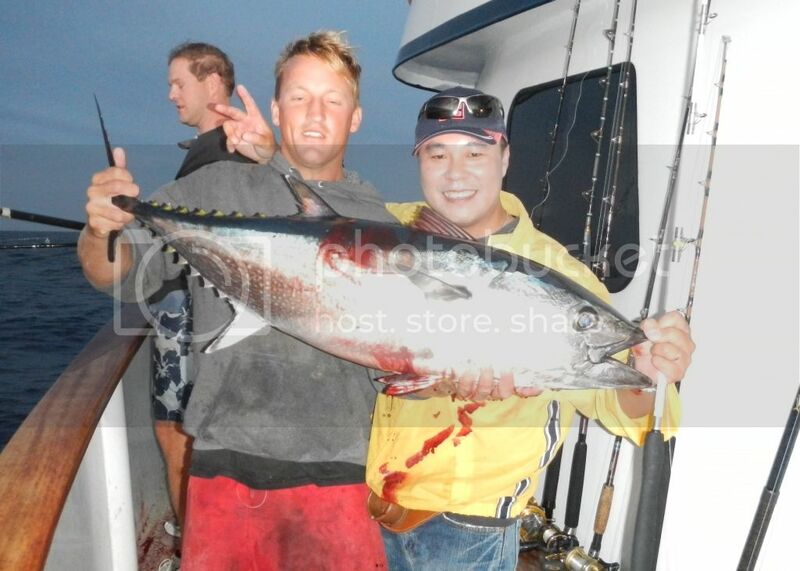 The ¾ day boat Malahini caught 2 Bluefin Tuna, 4 Yellowtail and 31 Dorado on their trip on Wednesday, 08-22-12. The weather forecast for both Saturday and Sunday looks fantastic for both the offshore and local. Always check the latest forecast before leaving the dock. 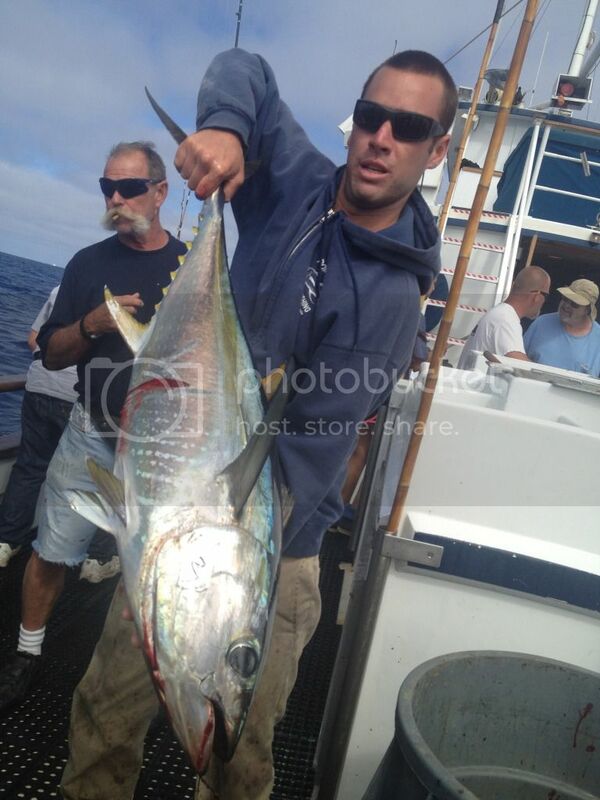 Offshore Grand Slams-Yellowfin Tuna, Bluefin Tuna, Do Dos and Tails. 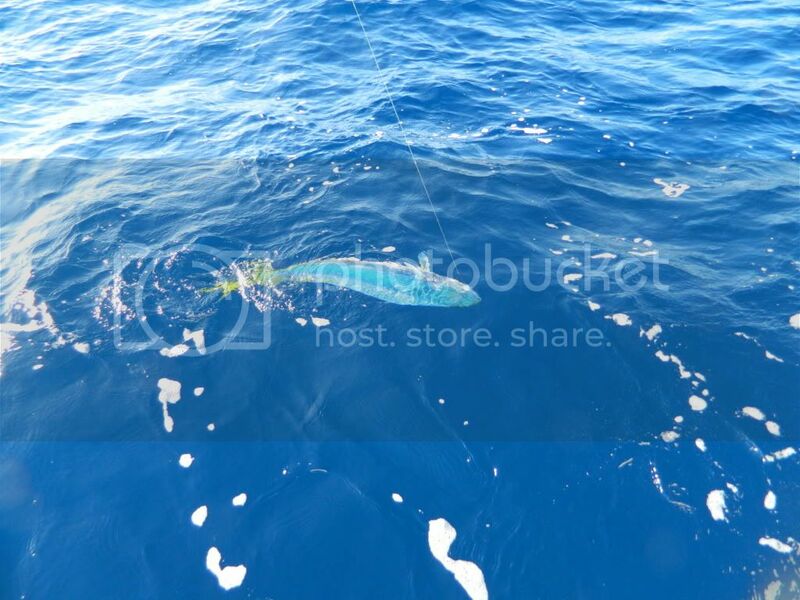 The weather has been sensational during the week and provided excellent opportunities for catching an Offshore Grand Slam; which is catching all four species on a single trip, usually in a single day, not all that common, yet has happened more frequently has fishing has been outstanding. 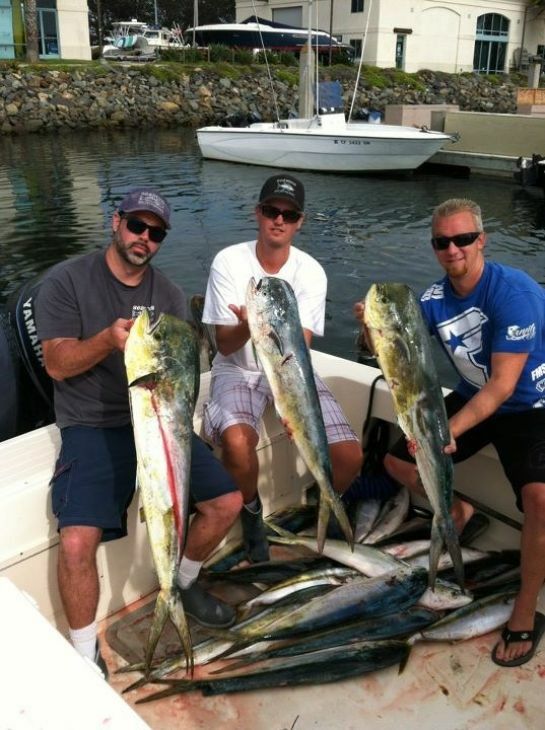 More and more Dorado (Mahi Mahi), are being caught off Kelp Paddies along with Yellowtail and the two species of Tuna. 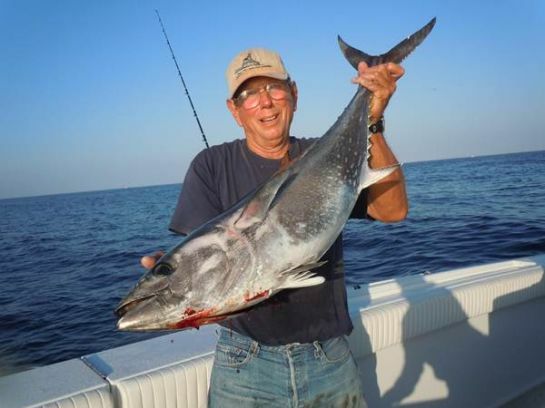 There have been some excellent trips in one day range where limits of Bluefin Tuna were caught. 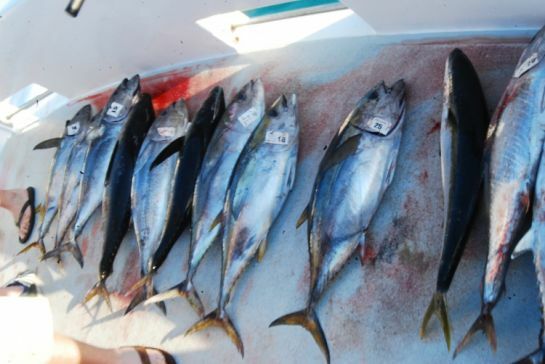 The area below 120 miles and on down to 150 miles has provided more opportunities for catching Yellowfin Tuna, to go with the other species being targeted. On any given day the catch is dependent on finding the Mother Load Kelp Paddy, often only one Paddy needs to be found to fill the boat up. If the Captain and crew cannot find that magic Kelp, it can lead to a disappointing trip. Open water schools of fish are few and far between, I.E. there is a distinct lack of troll fish being caught. 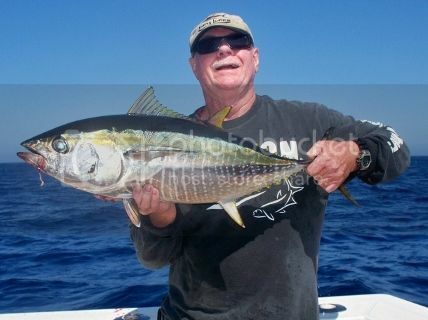 Angler Ron hit the Jackpot, literally on the Condor which docked Wednesday morning, 08-08-12, returning from a 1.5 day trip that caught the offshore grand slam, Yellowfin, Bluefin Tuna, Dorado and Yellowtail. 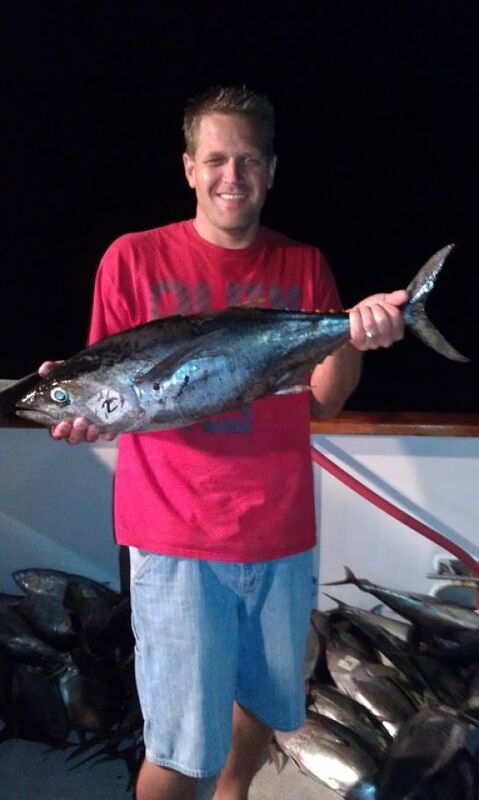 Ron won the jackpot with a big Yellowfin Tuna to go with his personal slam, congrats Ron! 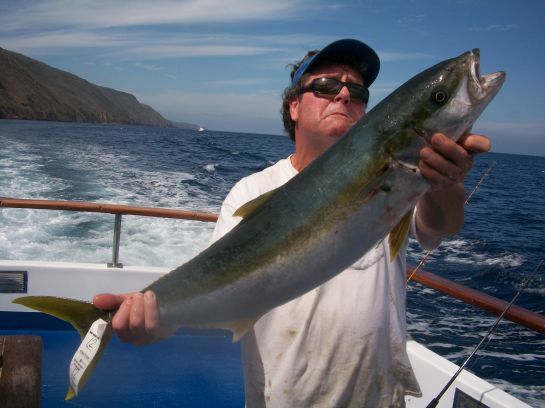 At San Clemente Island the big Yellowtail and White Seabass are showing up in the counts. Catalina remains very quiet, for this time of year. Generally the best Sand Bass fishing is in the evening on the Twilight runs, although there have been some great Sculpin fishing too. 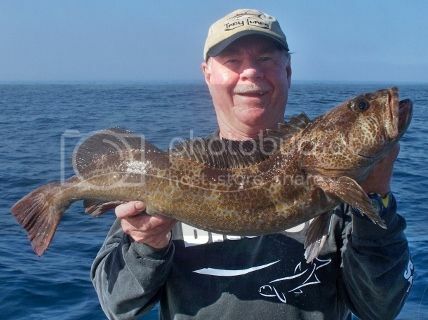 The Enterprise fished on Monday, 08-06-12, and caught 47 Sand Bass, 1 Barracuda and 12 Sculpin. 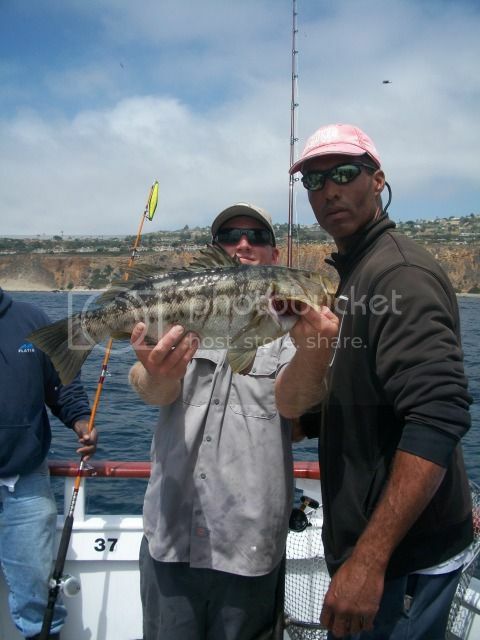 The Monte Carlo out of LA Harbor Landing ran a trip on Saturday, 08-04-12, and caught 42 Sand Bass and 4 Sculpin. 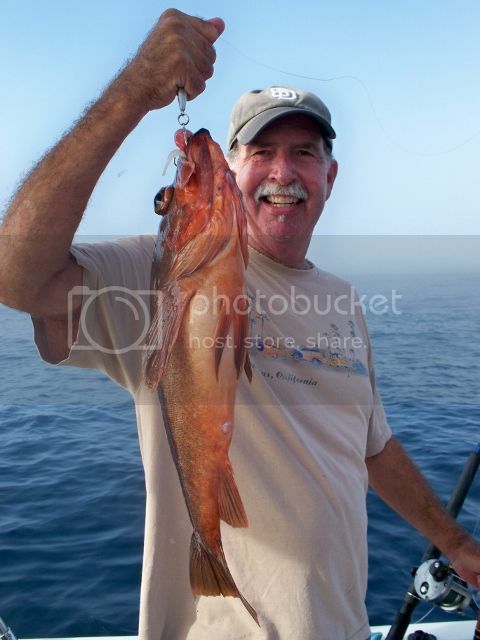 The Freelance fished Tuesday evening, 08-07-12 and caught 175 Sculpin and 50 Sand Dab. 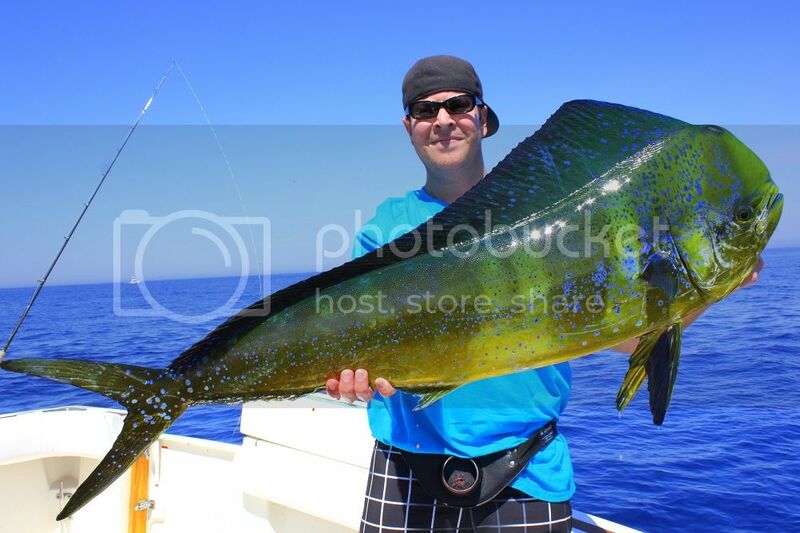 The 1/2 day boat Redondo found excellent Barracuda fishing on Sunday, 08-05-12, catching 12 Sand Bass and 126 Barracuda. They followed that trip up with good Calico Bass fishing on Thursday, catching 124. 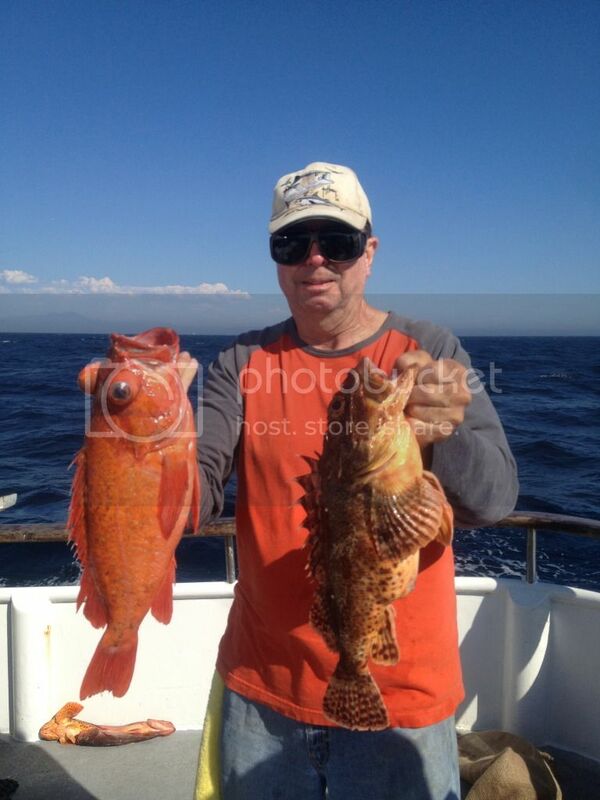 There has been some excellent Sculpin fishing with some good scores on the Calico Bass. 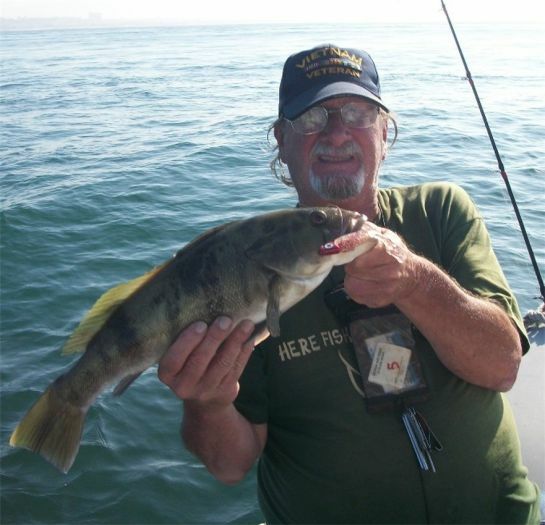 For example the Patriot caught 200 Calico Bass (limits) for the 20 anglers on their ¾ day trip, Thursday, 08-09-12. 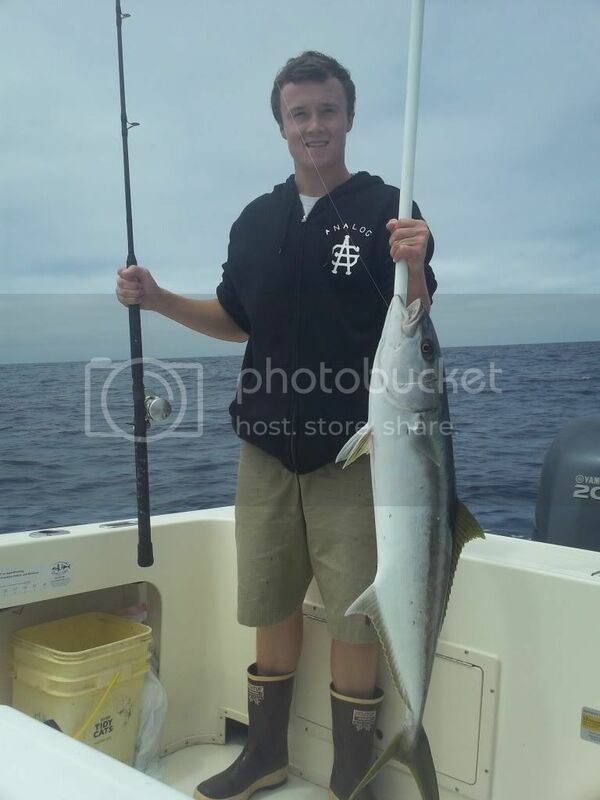 Great Barracuda fishing early in the week and good scores on the Twilight runs for Sand Bass. 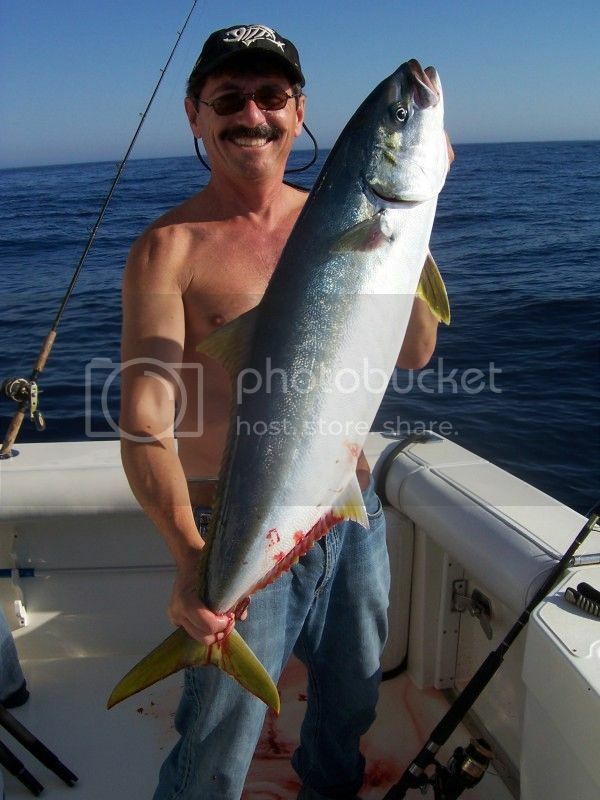 The City of Long Beach ½ day boat scored some Barracuda on Wednesday, 08-08-12. The Freedom still catching White Seabass and Yellowtail at the Islands, as they caught 3 Yellowtail, 4 White Seabass, 3 Halibut, 132 Calico Bass, 12 Barracuda, 11 Sheephead and 21 Perch on their Wednesday, 08-08-12 trip. The Pursuit out of 22nd St. Landing, ran to the Island on Wednesday, 08-08-12, with 55 anglers catching 51 Calico Bass, 43 Sheephead, 25 Whitefish, 33 Rockfish, 337 Perch and 10 Sargo. 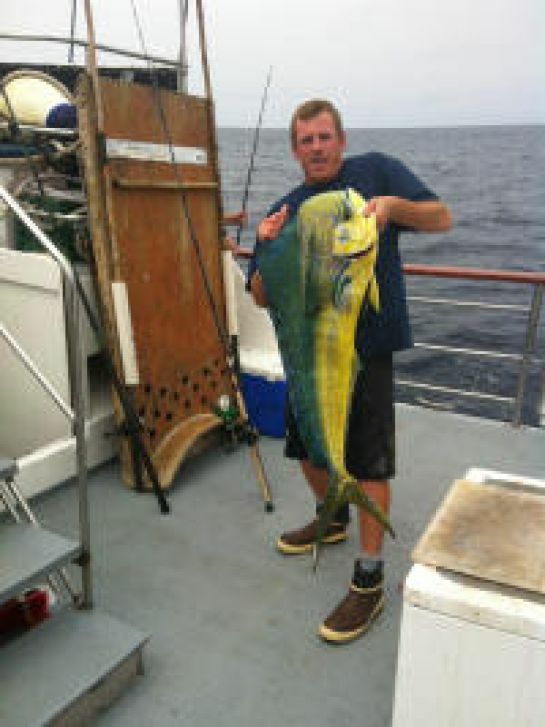 The ¾ day boat San Diego out of Seaforth Landing caught 6 Yellowtail and 38 Dorado on their Wednesday, 08-08-12 trip. The Mission Belle headed out on Thursday, 08-09-12, and caught 8 Yellowtail and 28 Dorado (limits). 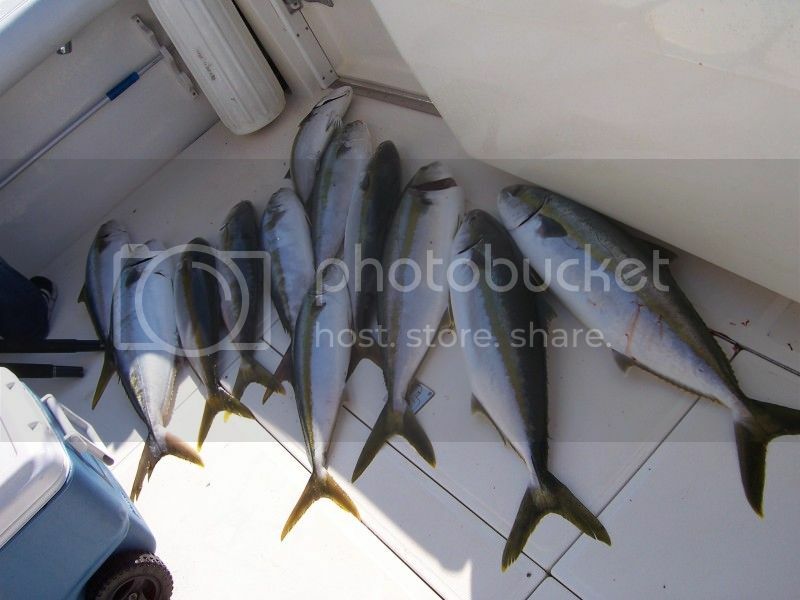 The ¾ day boat Malahini caught 1 Yellowtail and 18 Dorado on their trip on Tuesday, 08-07-12. The weather forecast for both Saturday and Sunday locally looks to be very nice; the offshore scene also calls for calm conditions with under 10 knots of wind most of the time. Always check the latest forecast before leaving the dock.